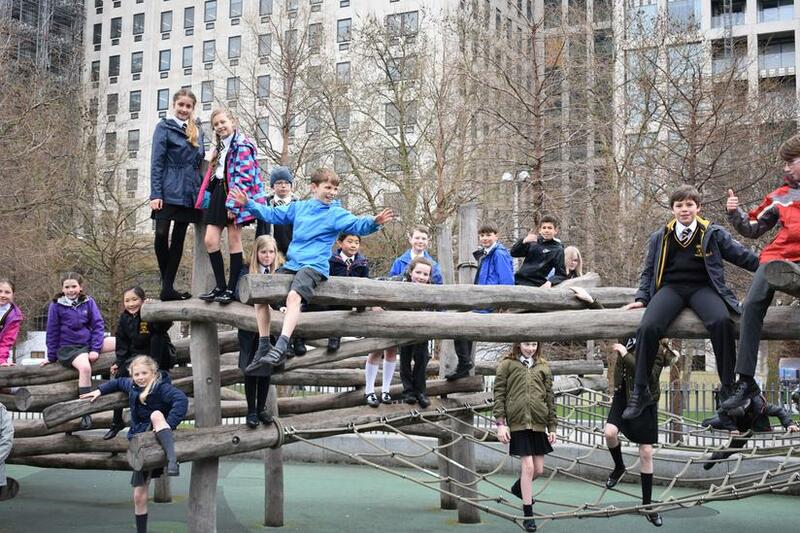 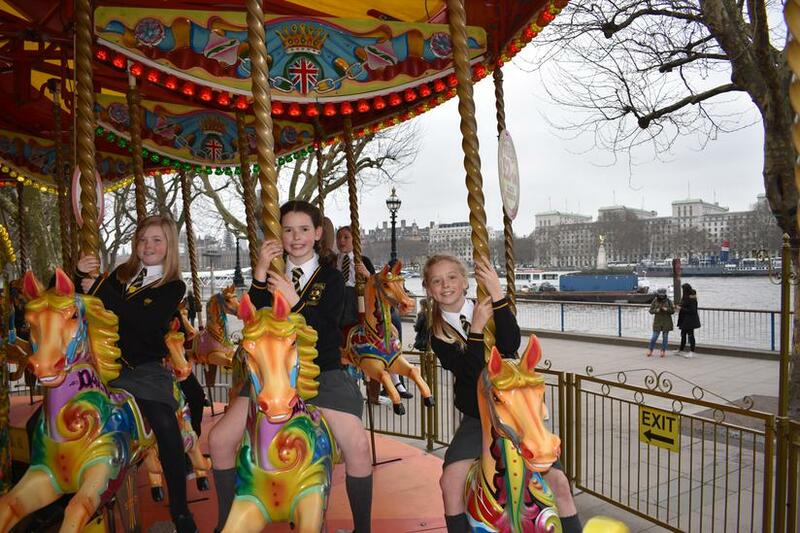 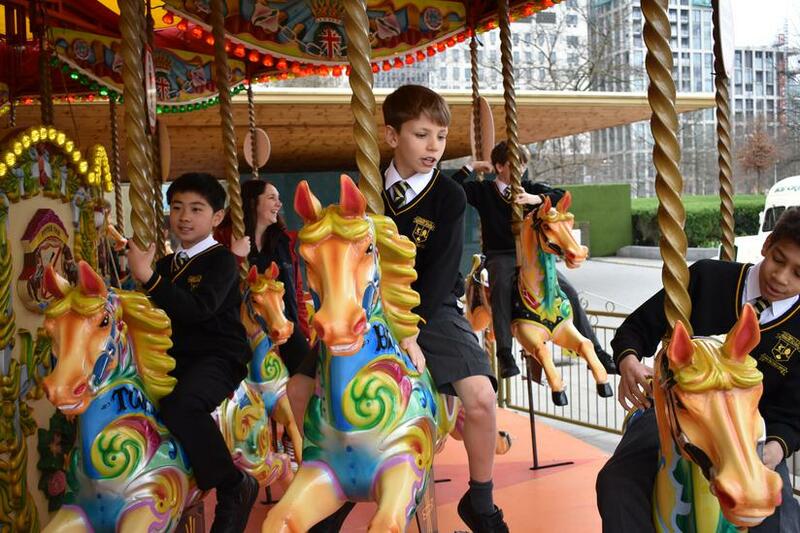 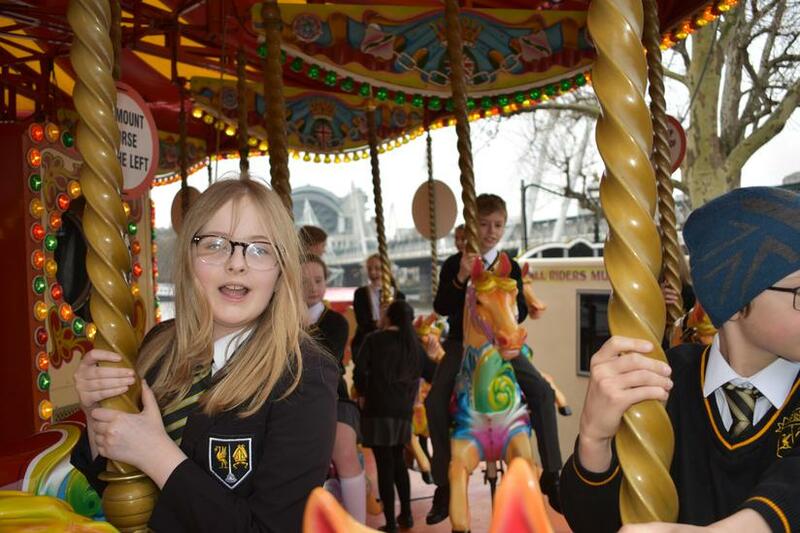 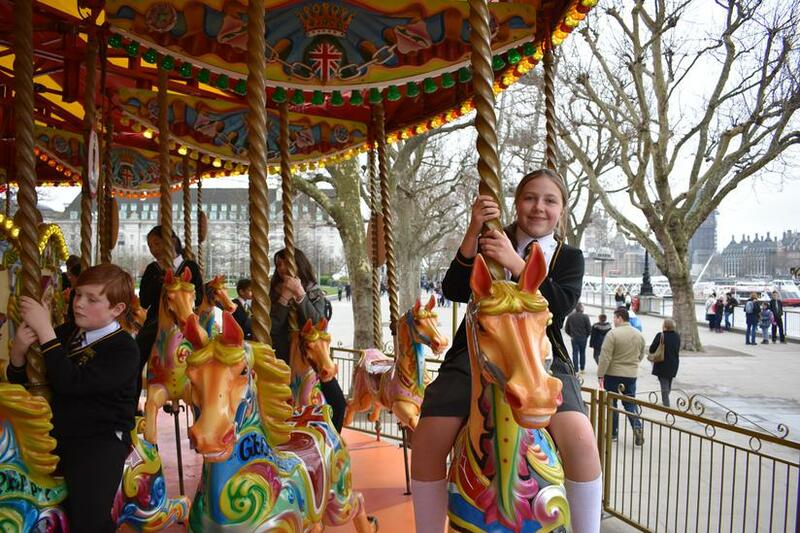 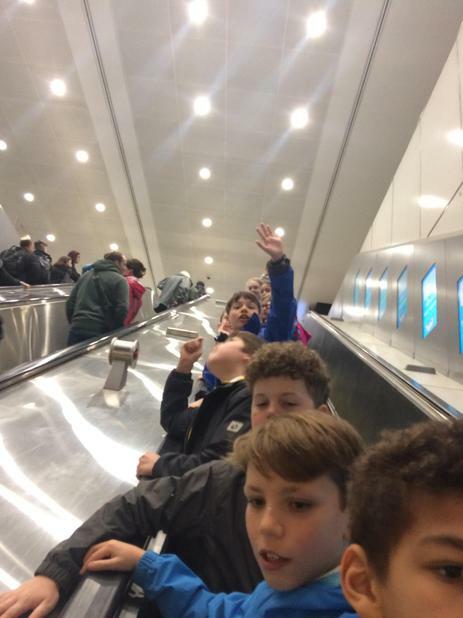 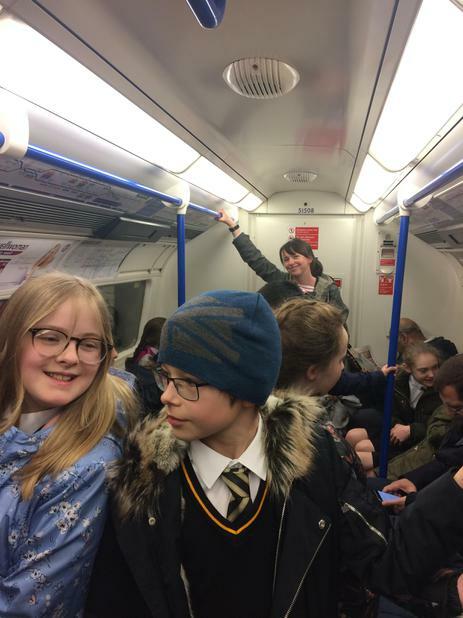 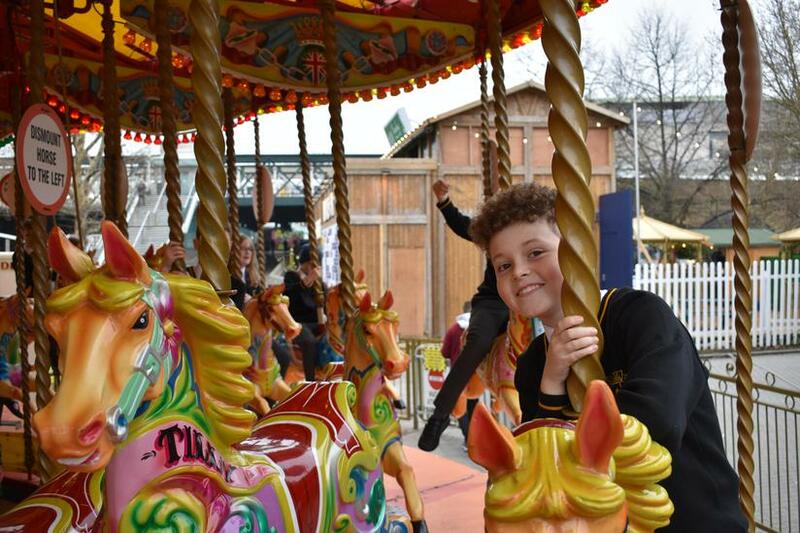 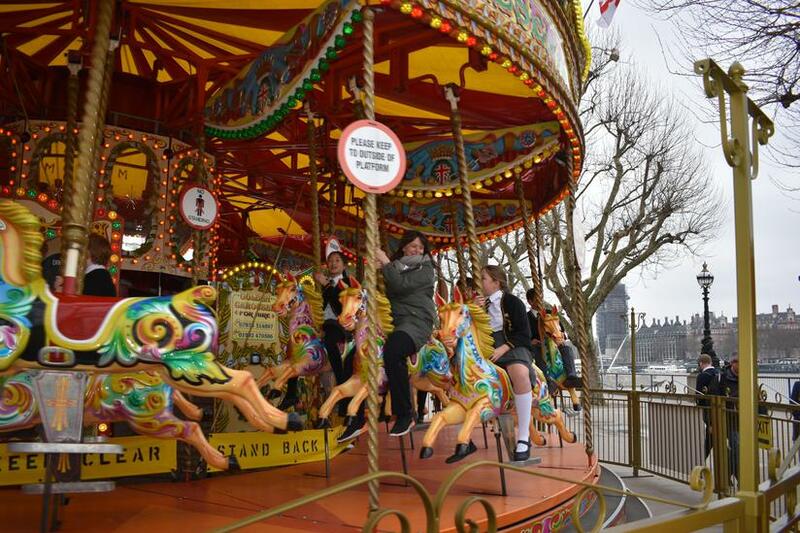 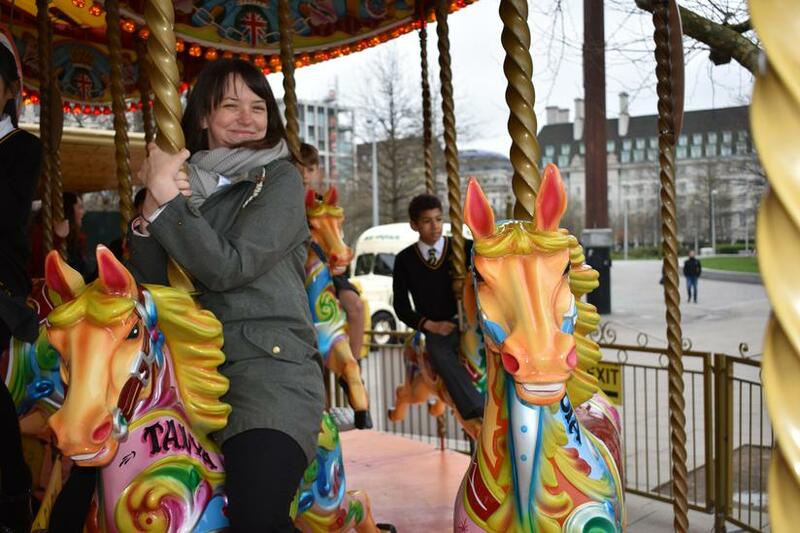 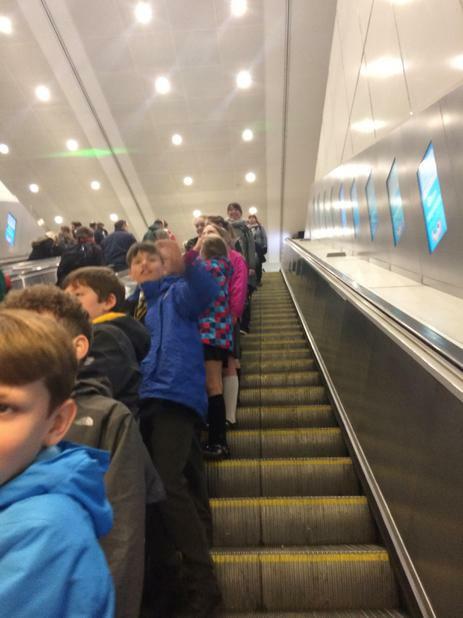 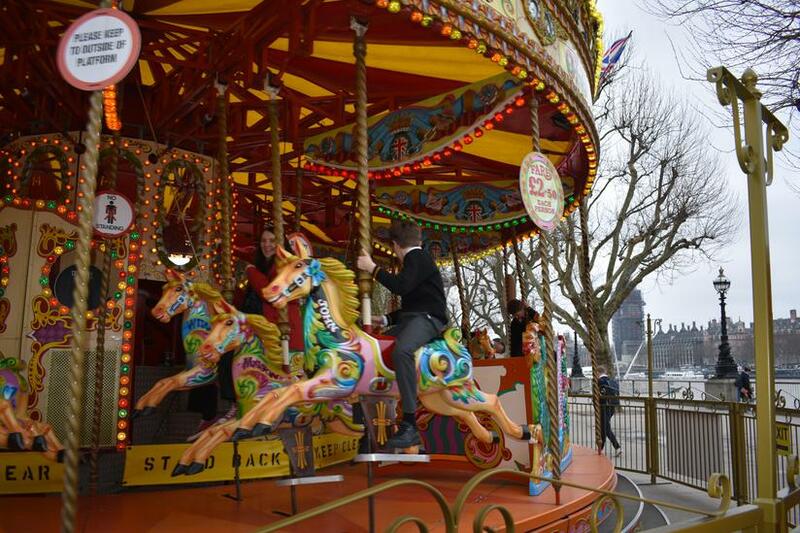 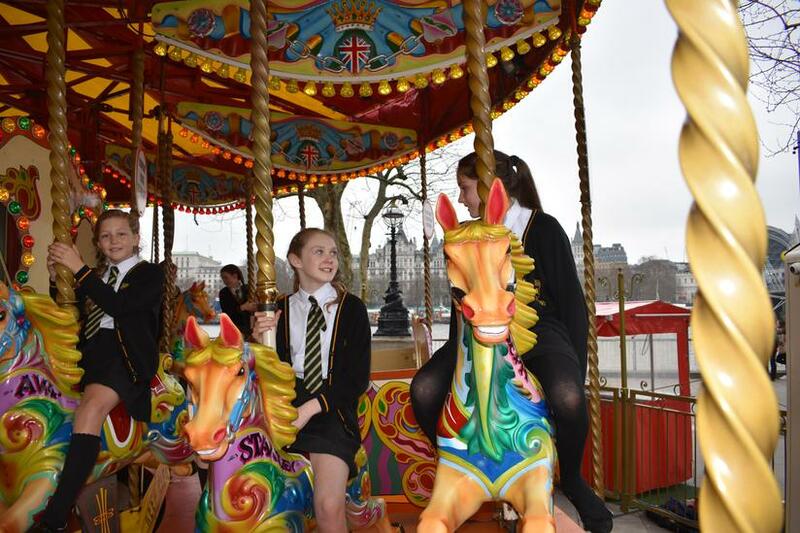 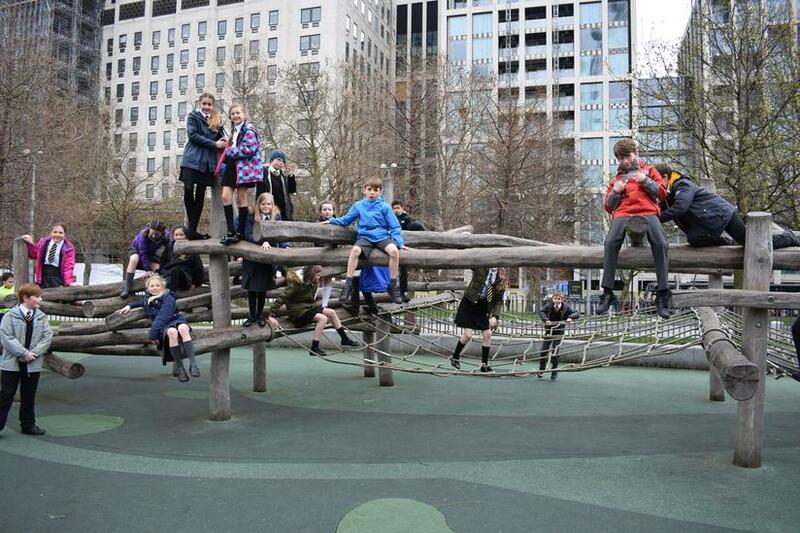 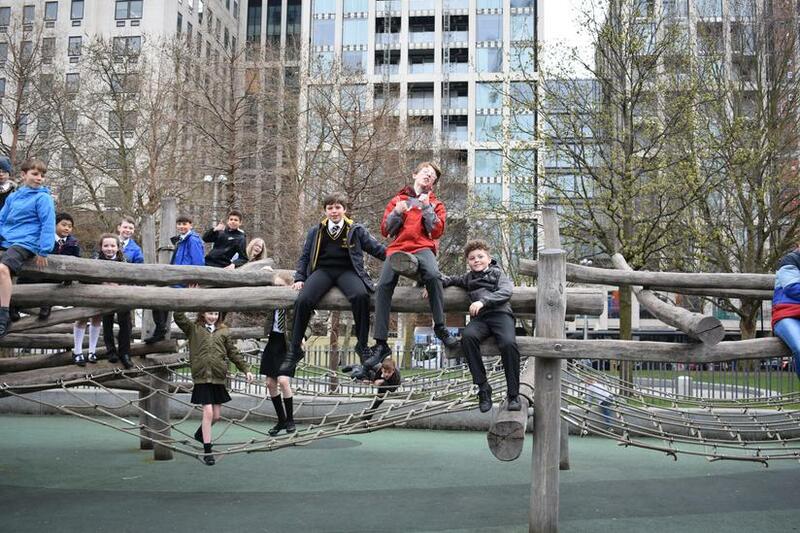 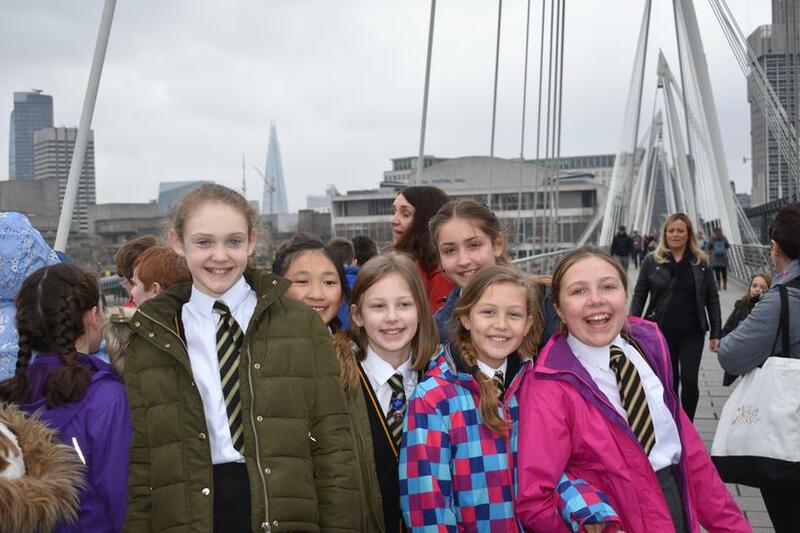 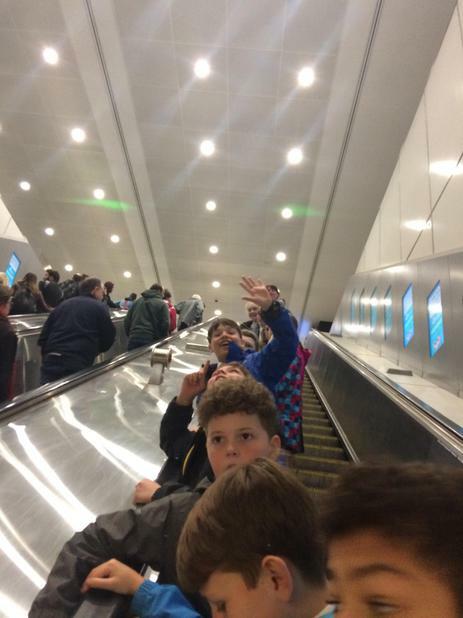 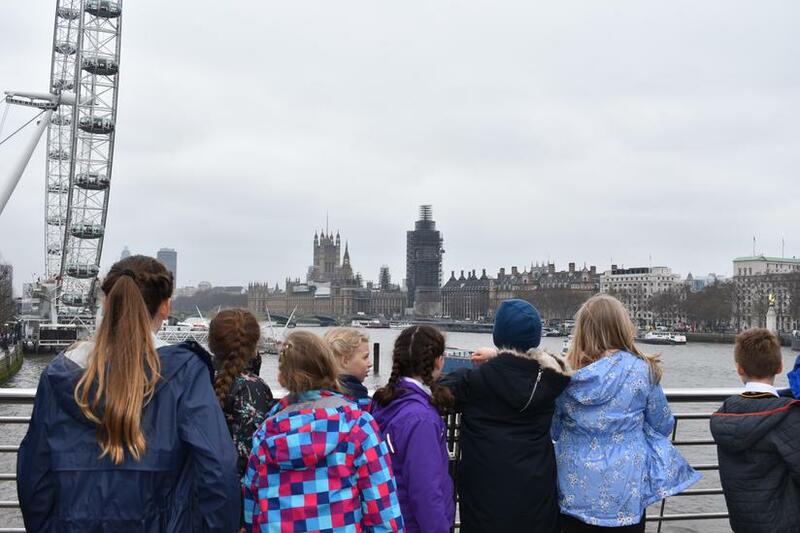 Our first stop in London was the South Bank and after a tour guide update from Mrs Mason who pointed out Waterloo Bridge, St Pauls Cathedral and The Gherkin we boarded the carousel for a ride. 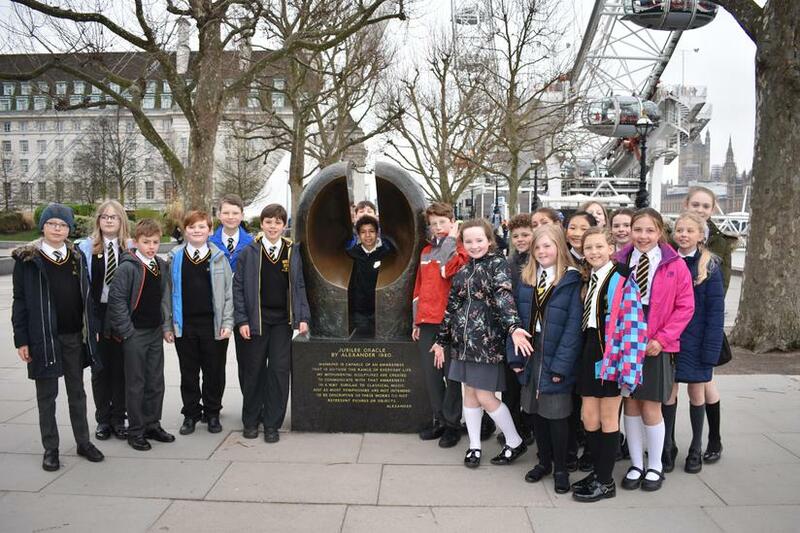 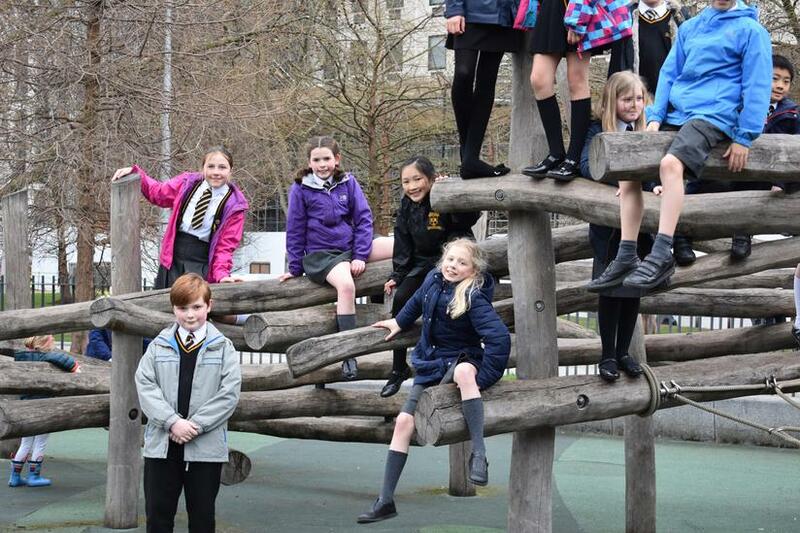 We then posed next to the Jubilee Oracle, a bronze sculpture inscribed with a quote from the artist, on the way to have a play in the Jubilee Gardens Playground area. 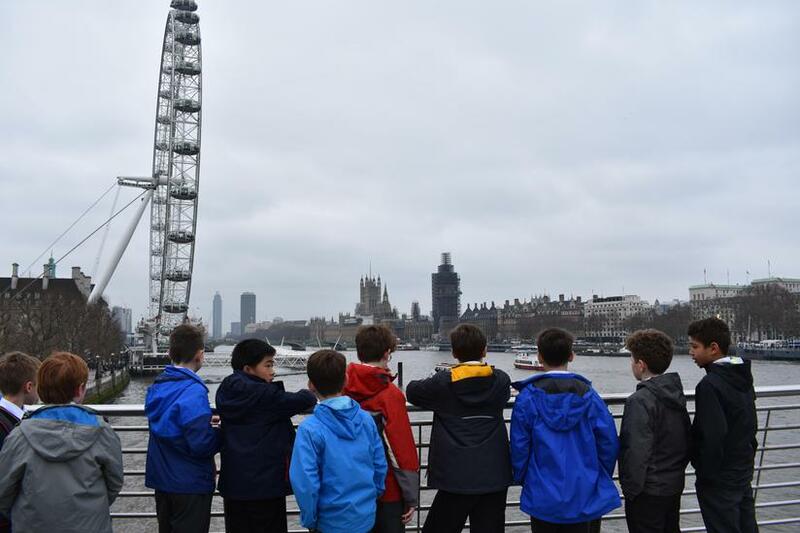 On the way to our lunch we looked out over the Thames to see the London Eye, Houses of Parliament, Big Ben (covered in scaffolding) and Westminster Bridge. 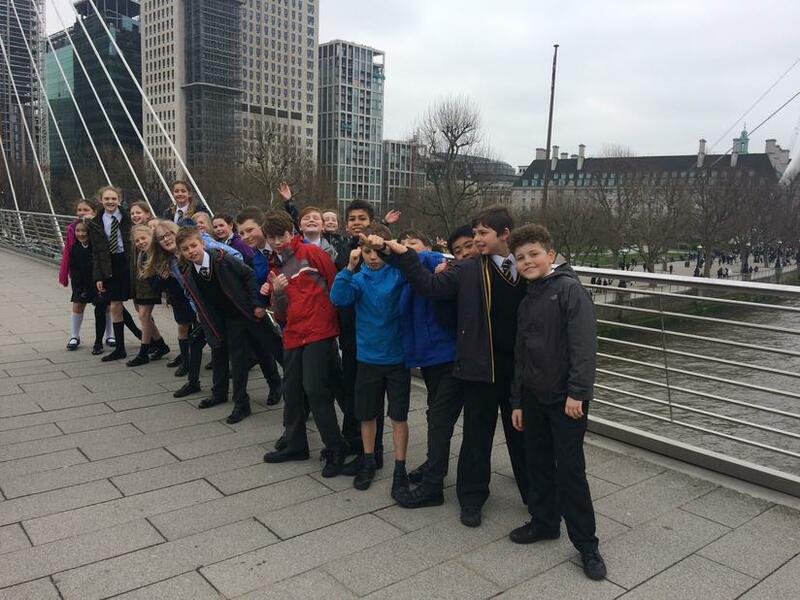 After a quick walk past Scotland Yard we refuelled ready for the afternoons adventures. 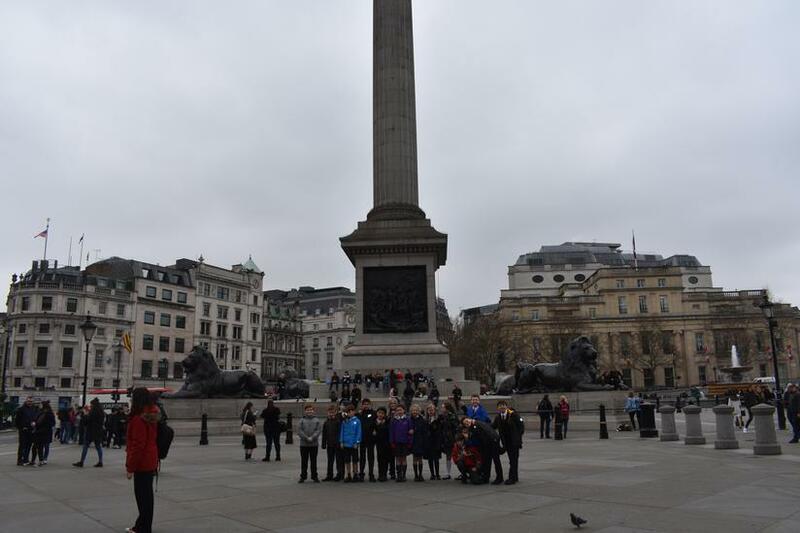 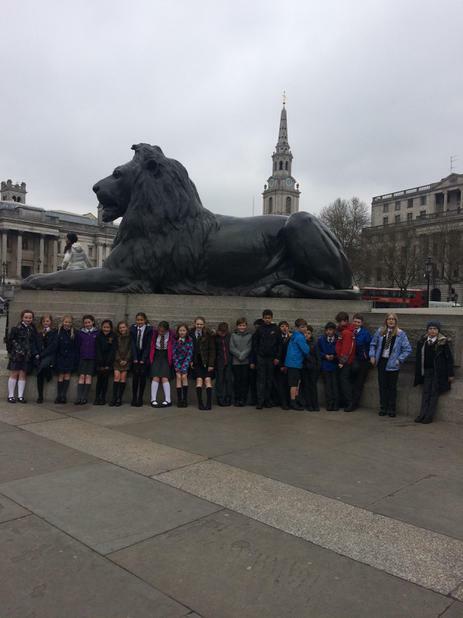 Next stop was Trafalgar Square where we had our photographs taken with Nelson’s Column and the four lions that guard it. 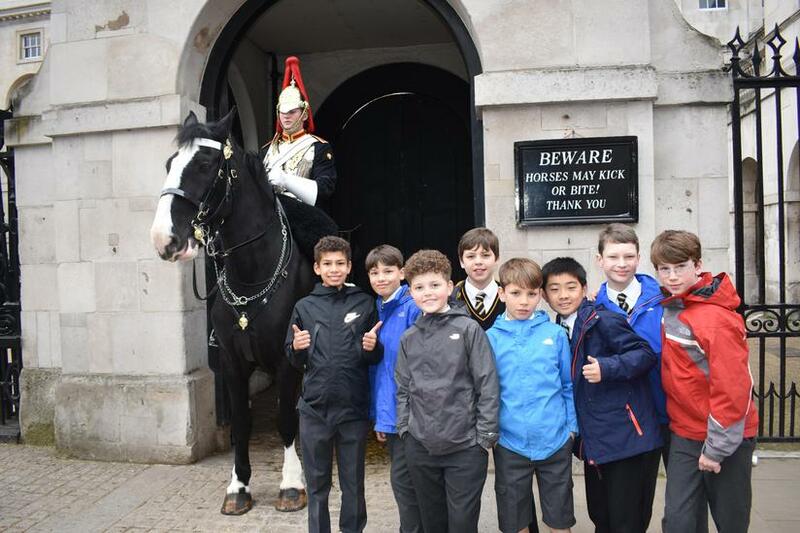 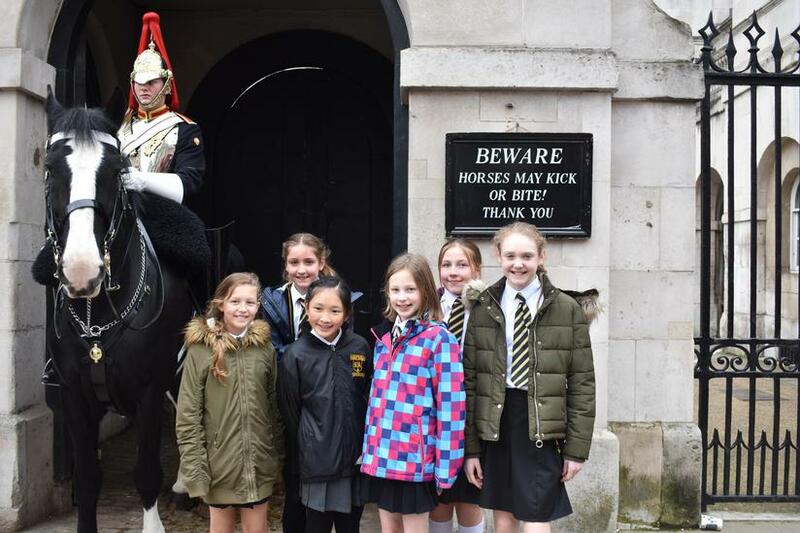 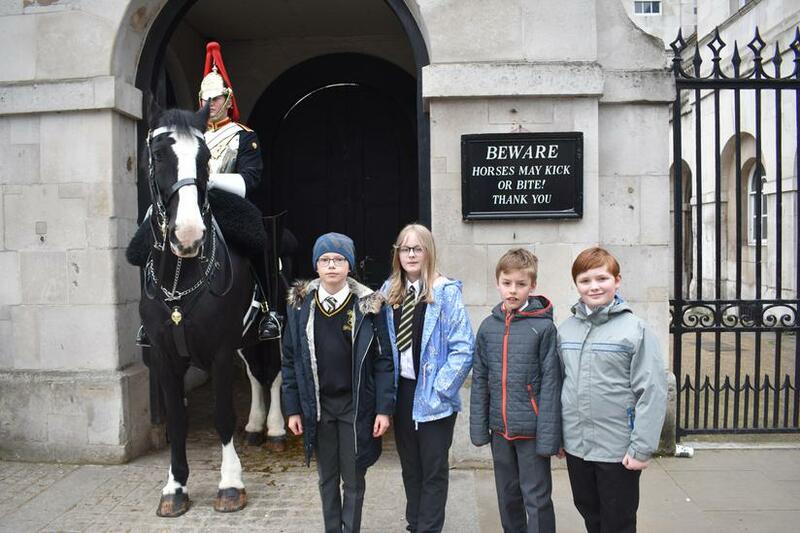 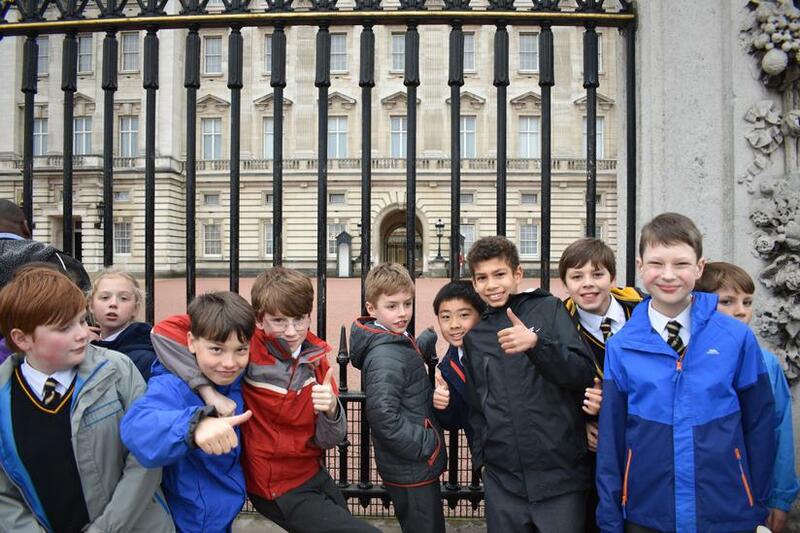 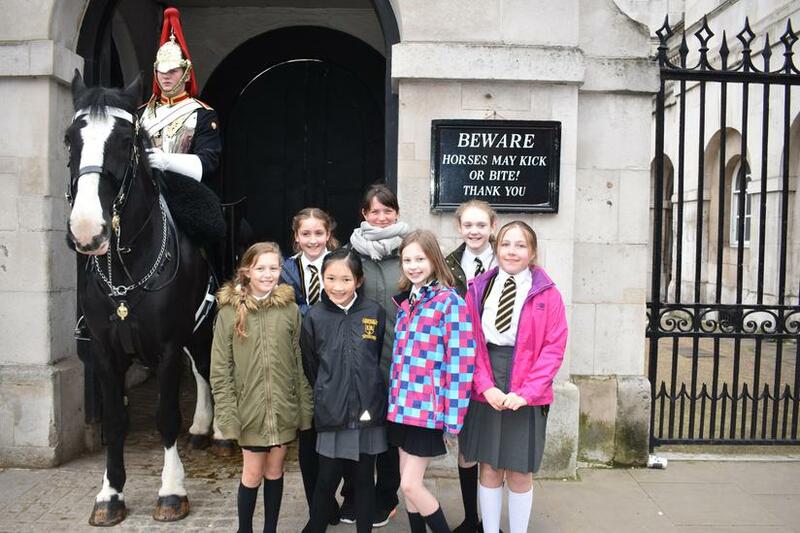 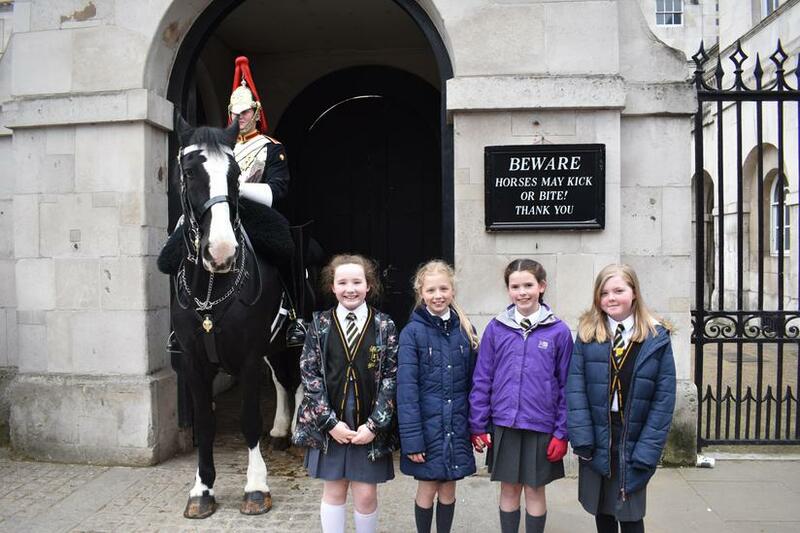 We then made our way down to Downing Street via the Horse Guards and more photos. 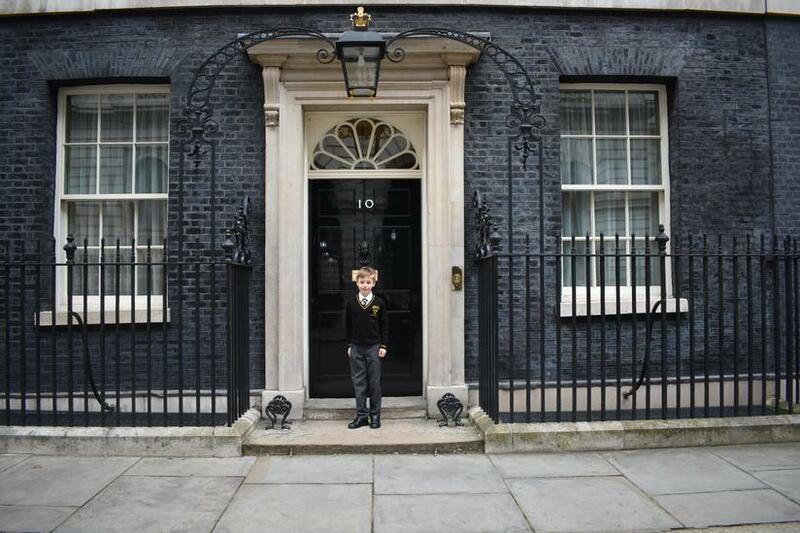 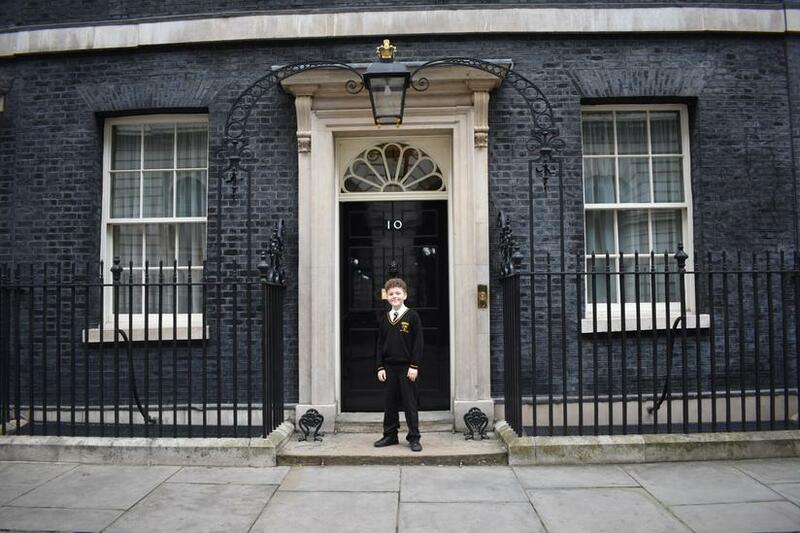 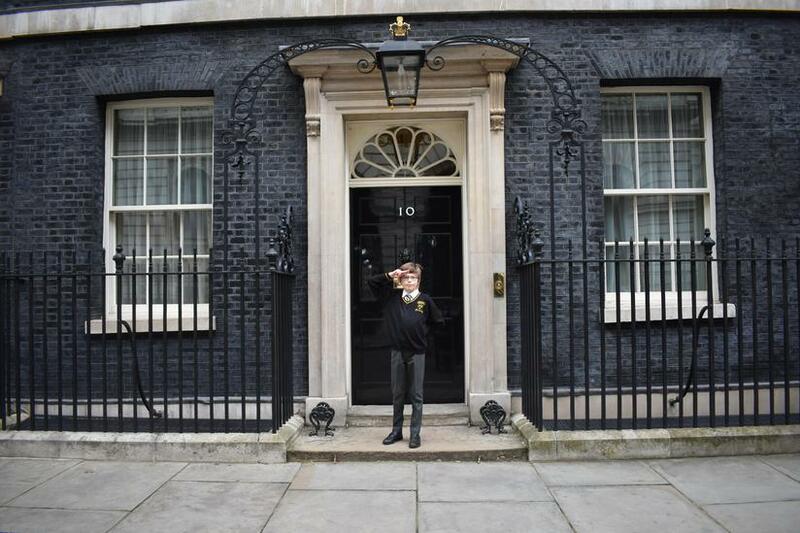 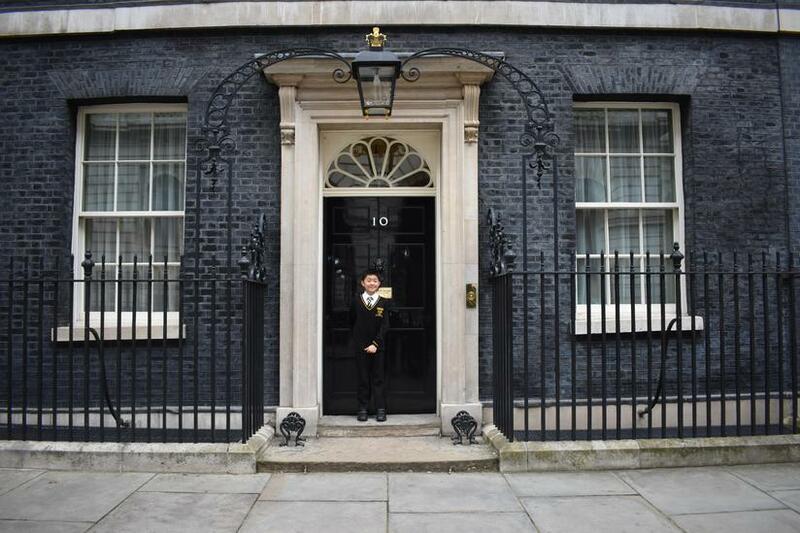 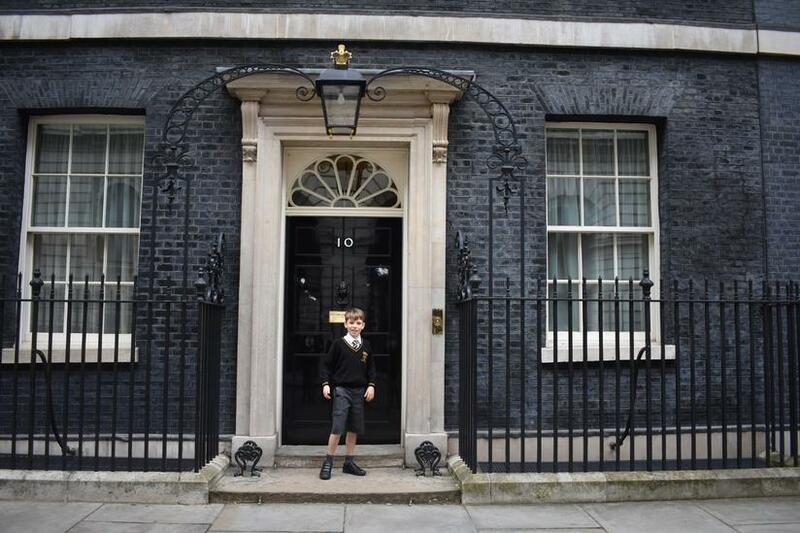 After an epic photo shoot at the entrance of 10 Downing Street, Luke led the way and knocked on the door, it opened and we were invited inside. 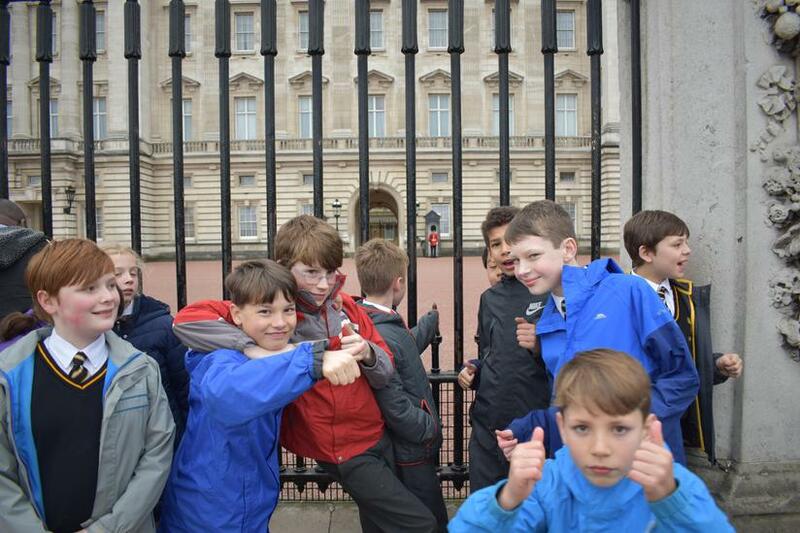 We took a minute to take off our coats and pinch ourselves. 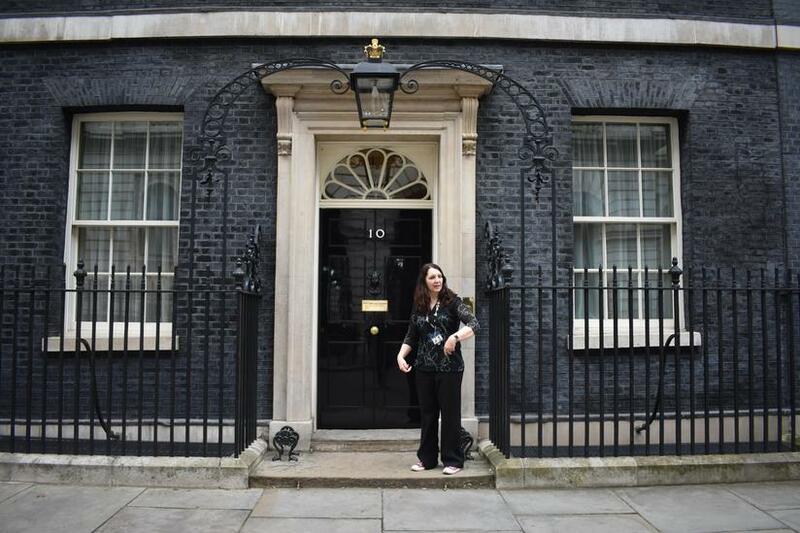 We were now amongst the very few people who have been allowed behind the iconic front door. 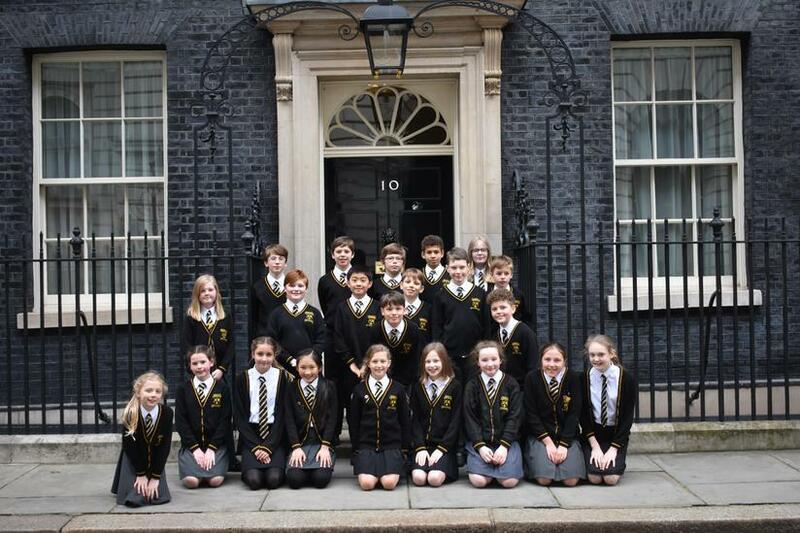 We were thanked for our wonderful letters and artwork that formed part of the diplomatic gift taken by the prime minister and presented to the Chinese Premier, Li Keqiang in February. 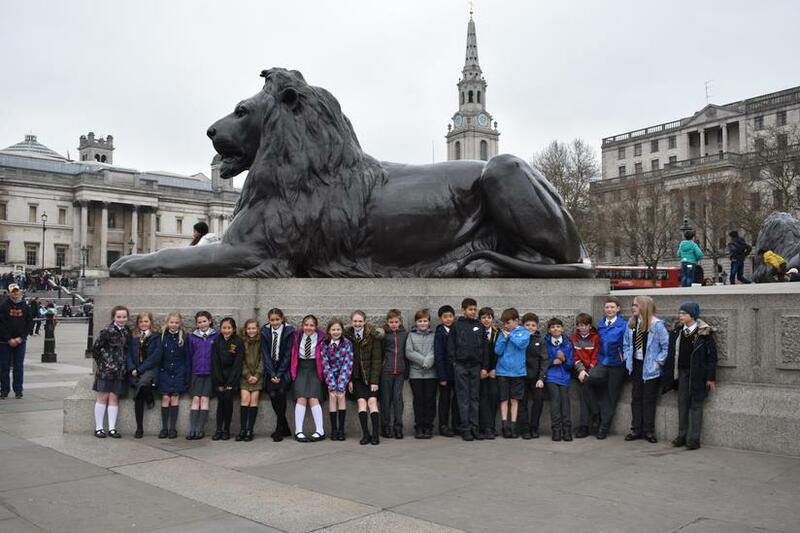 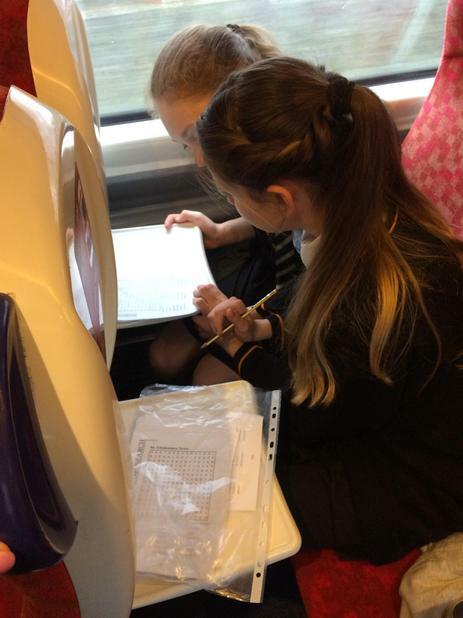 We heard how Li Keqiang loved our letters and hearing about our excitement of the trips to visit the Terracotta Warriors and enjoyed seeing our drawings of the warriors and of the Liverpool skyline. 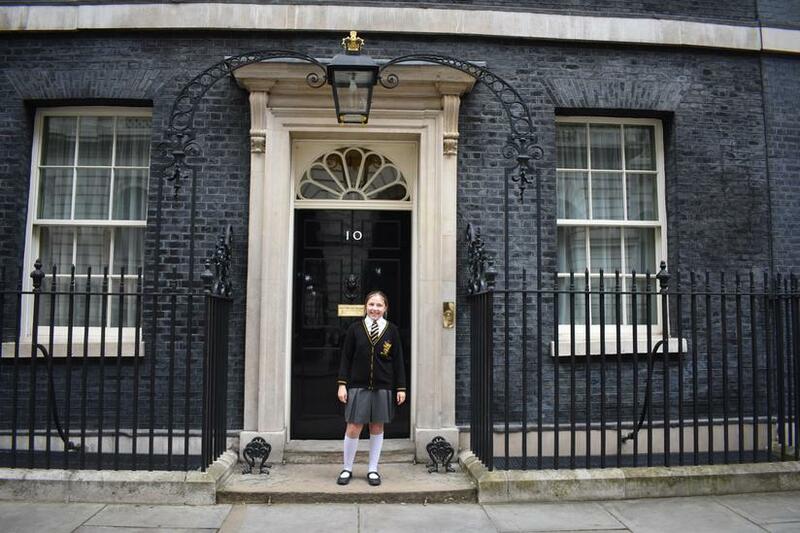 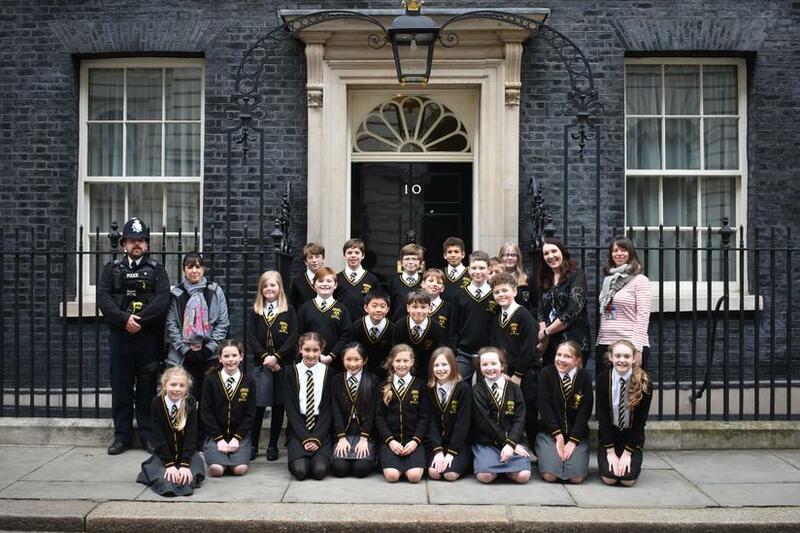 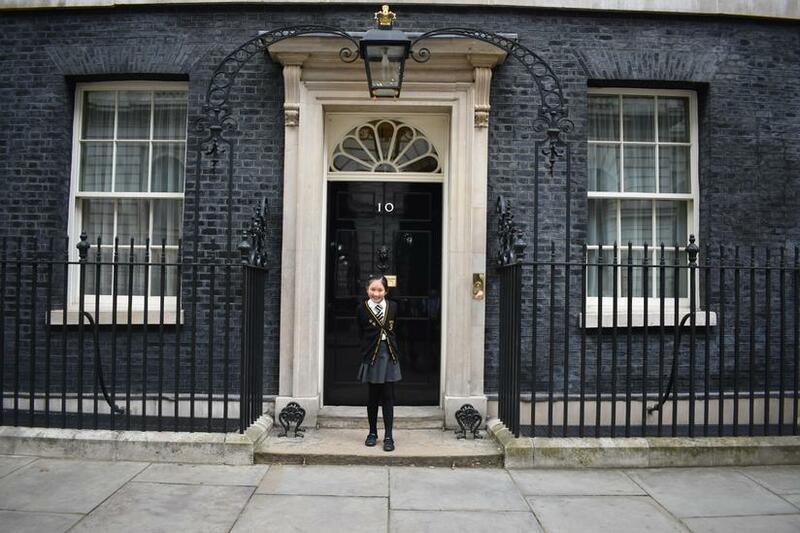 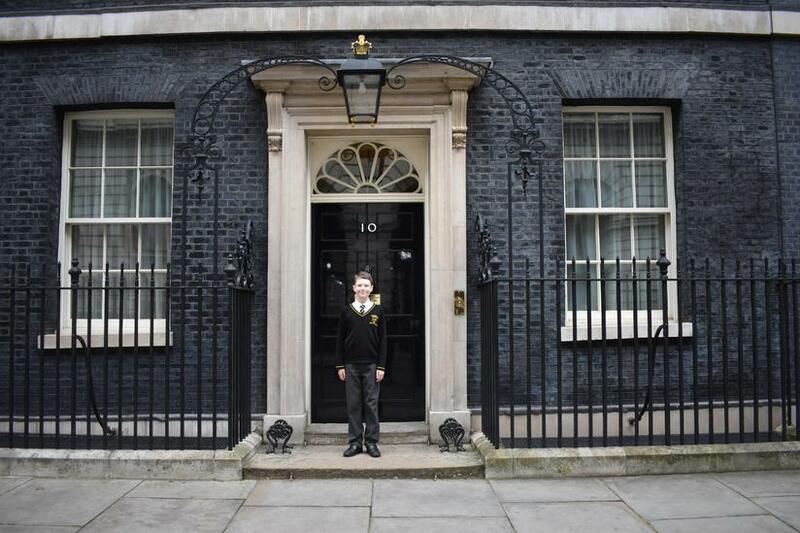 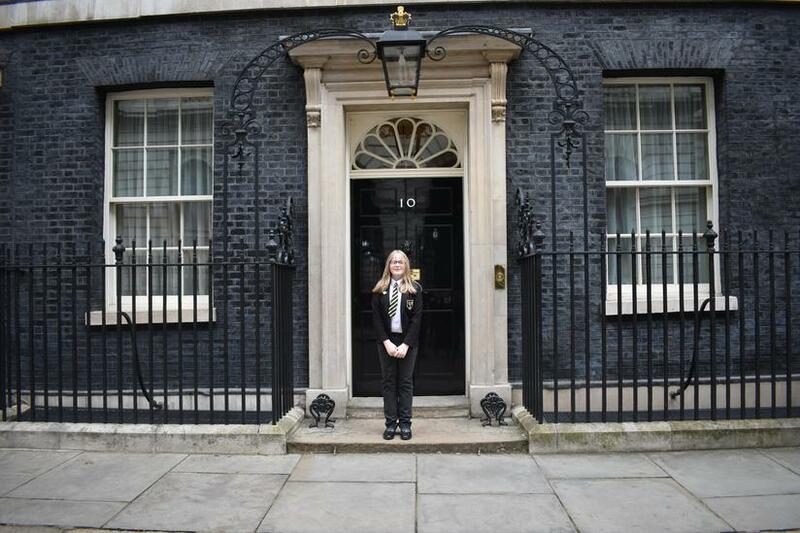 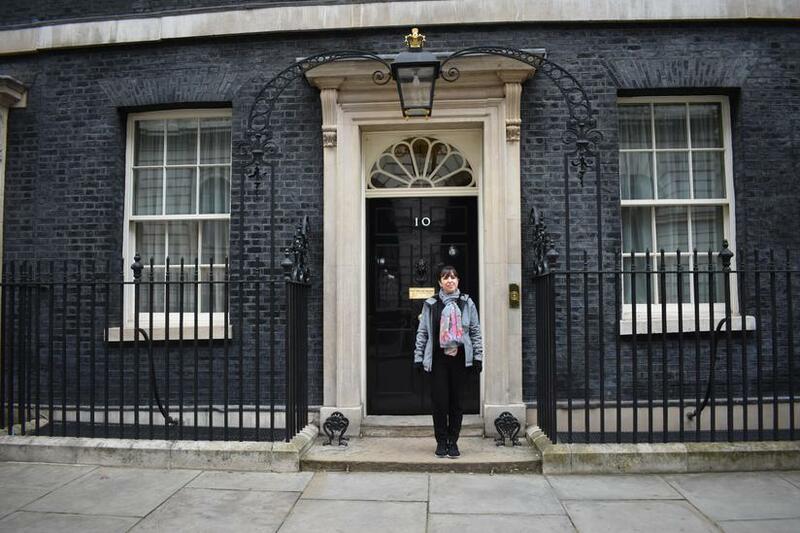 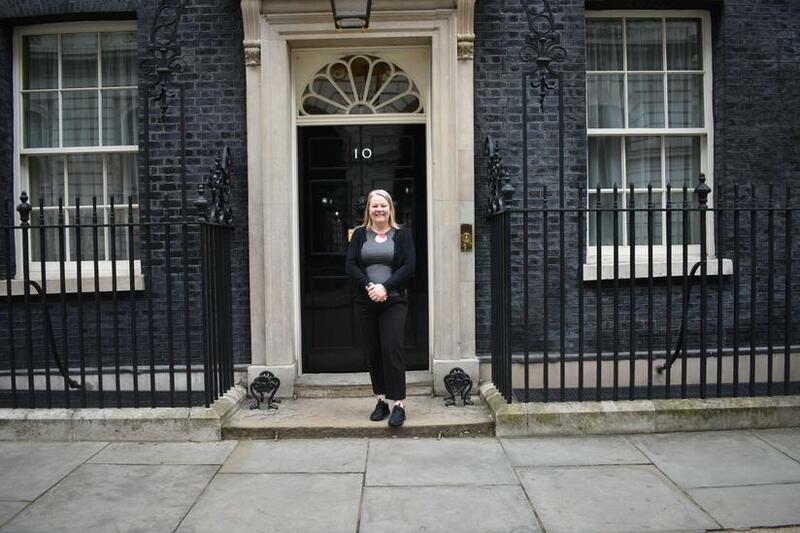 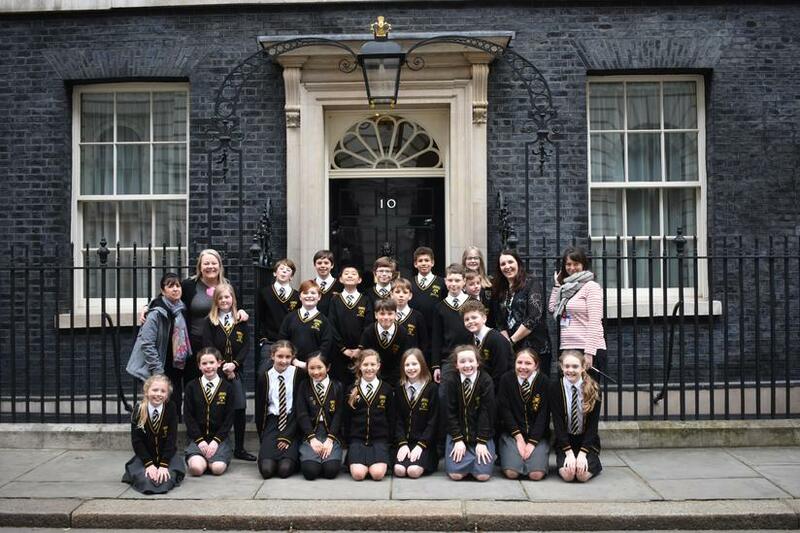 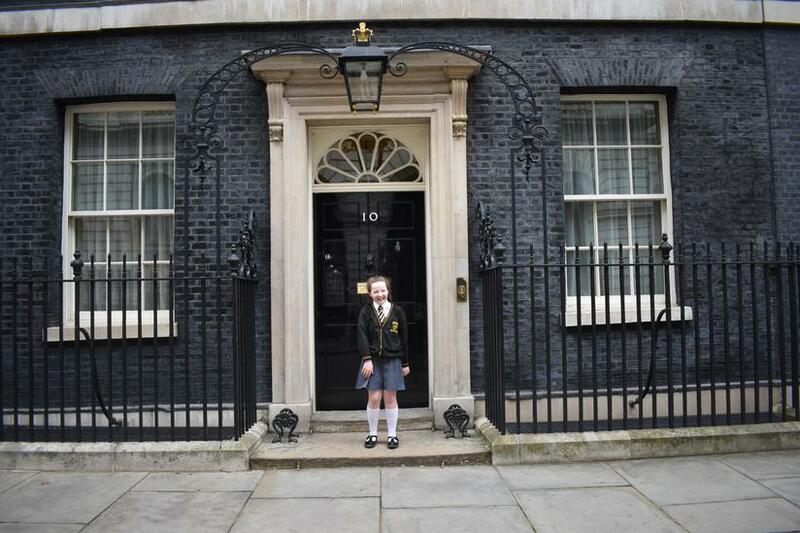 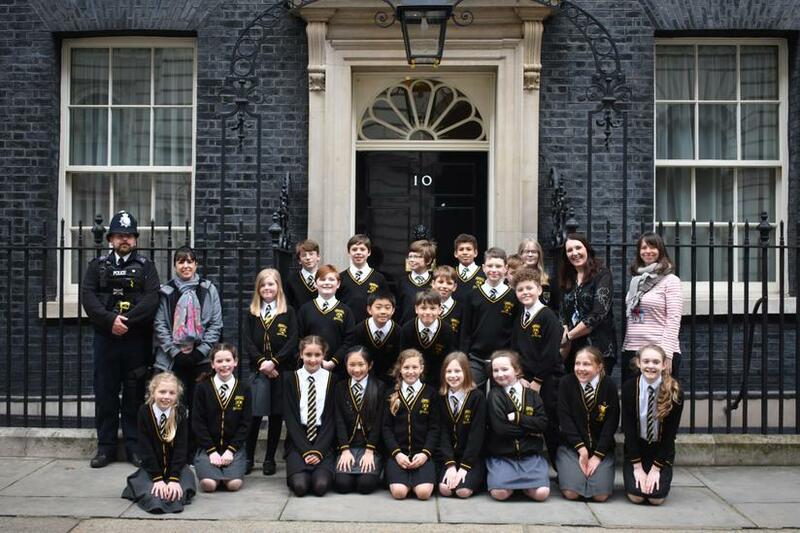 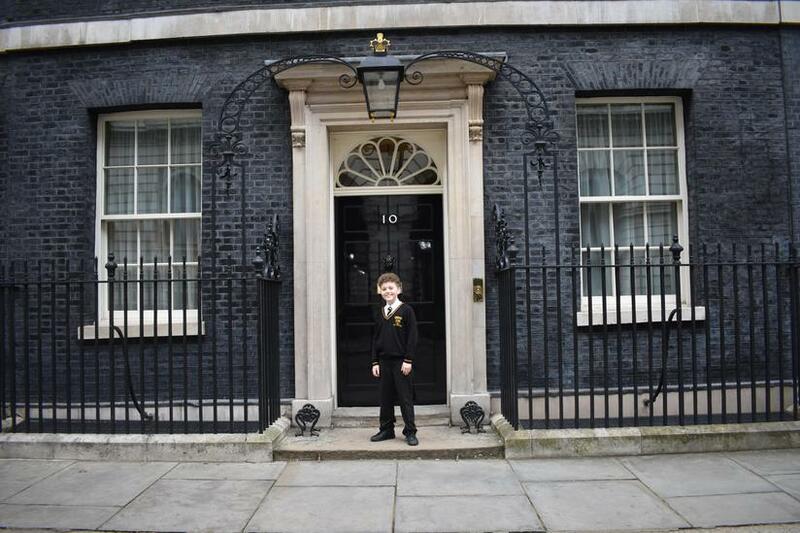 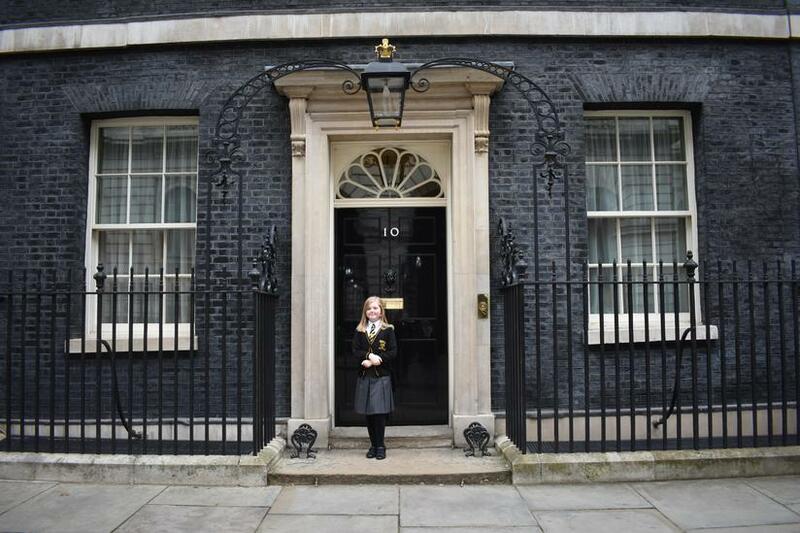 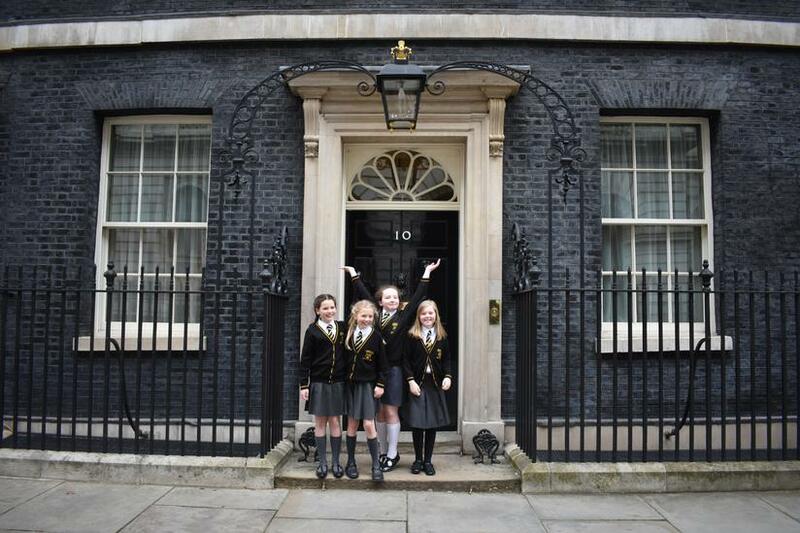 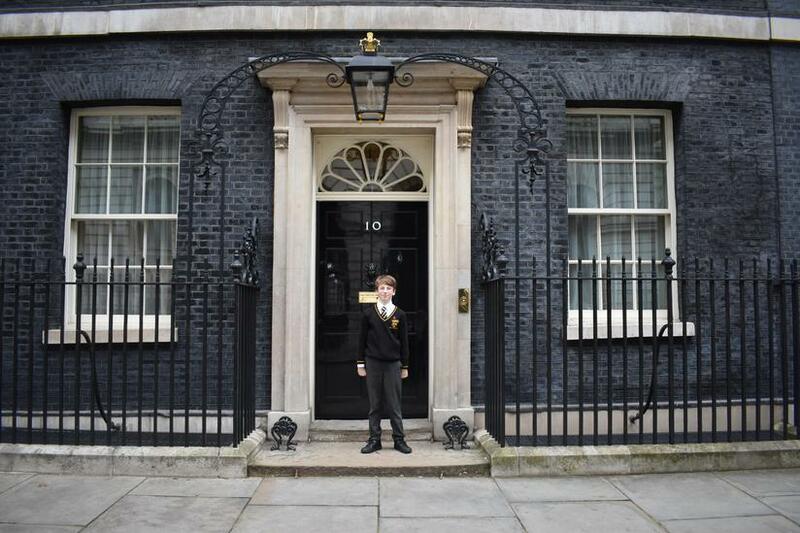 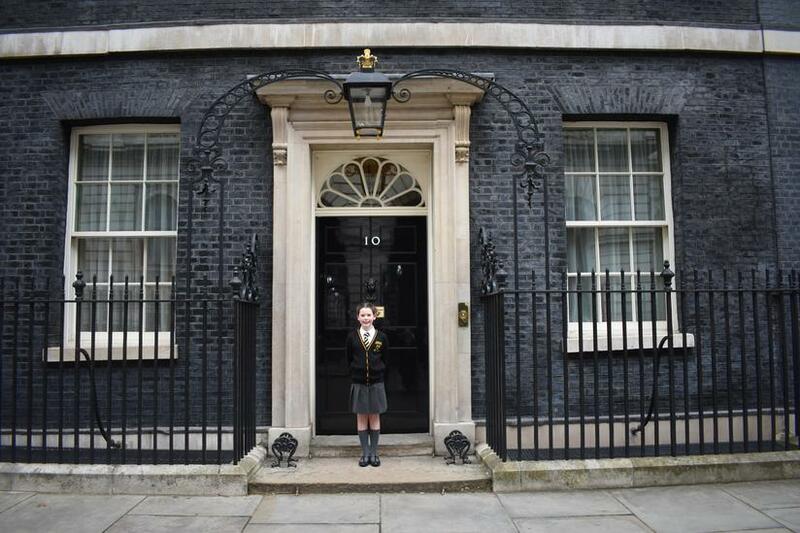 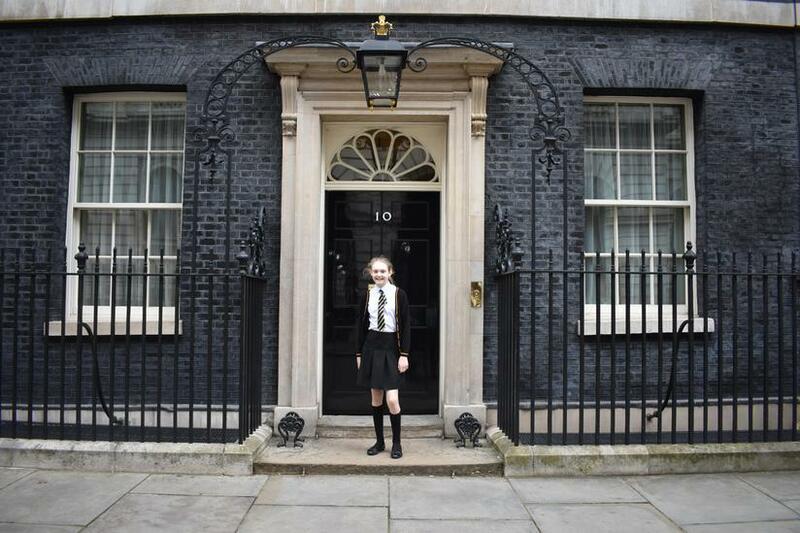 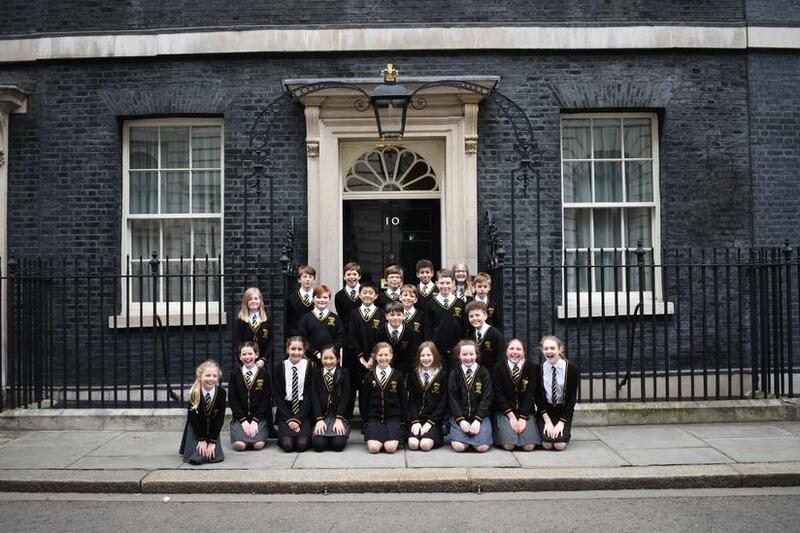 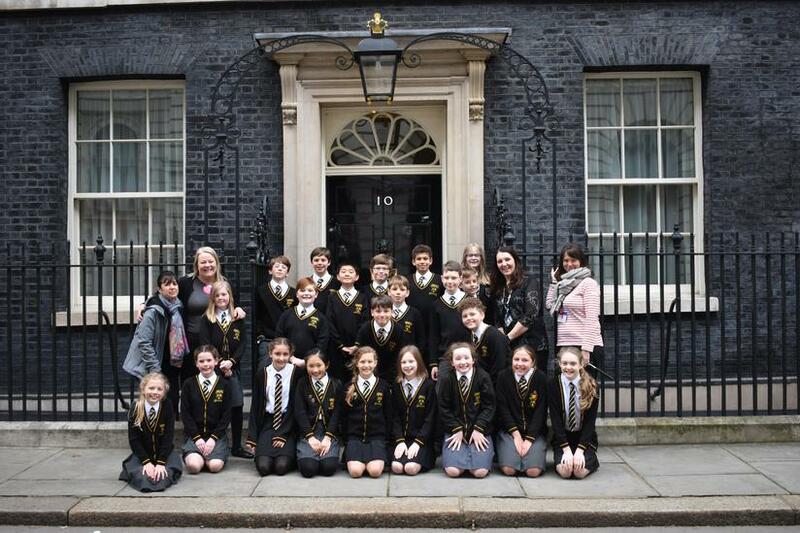 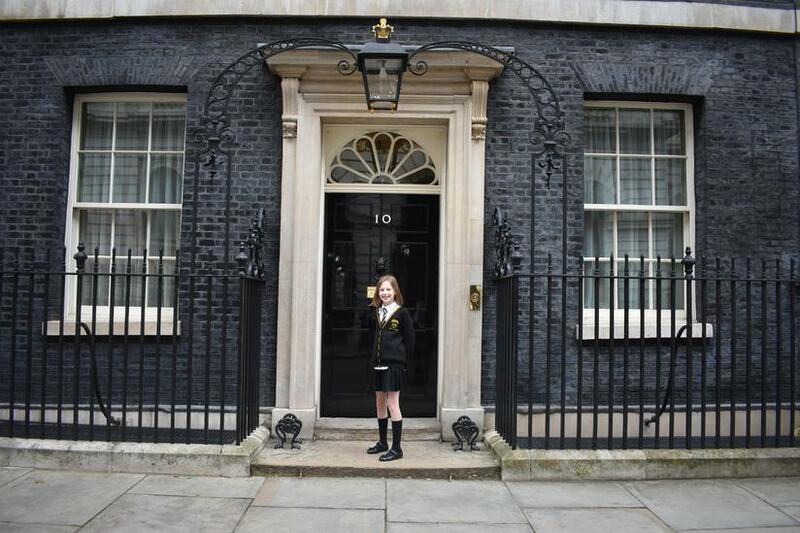 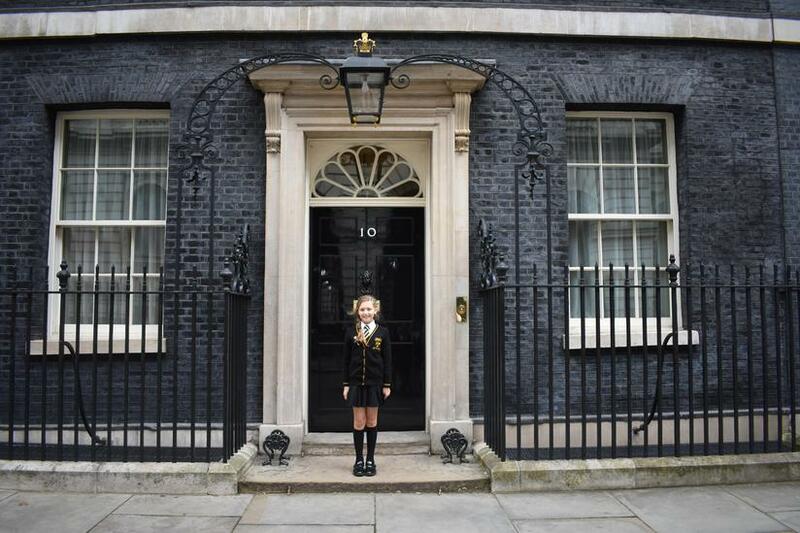 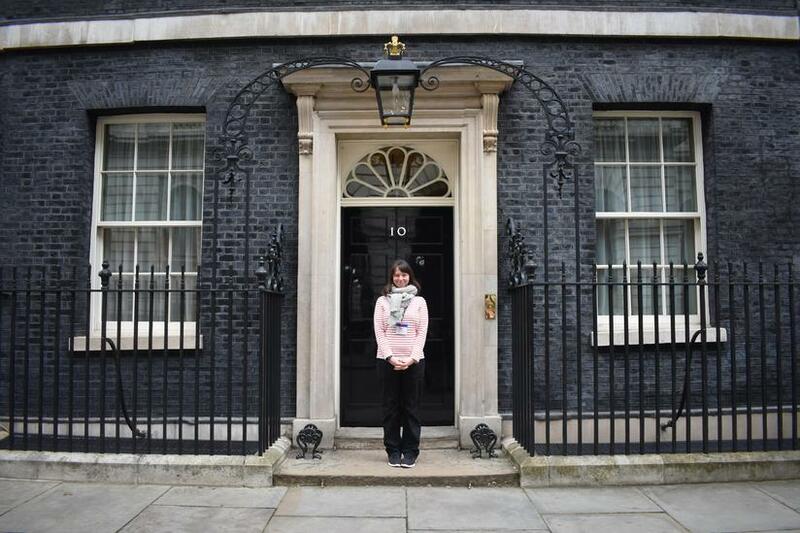 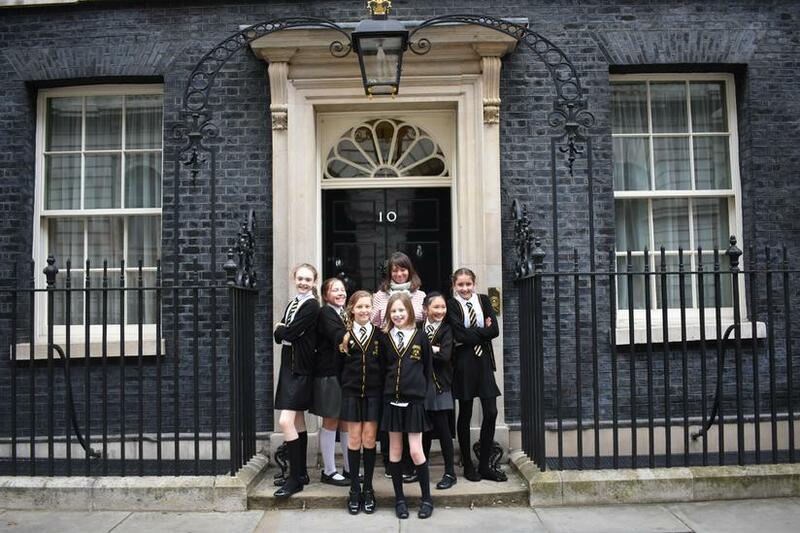 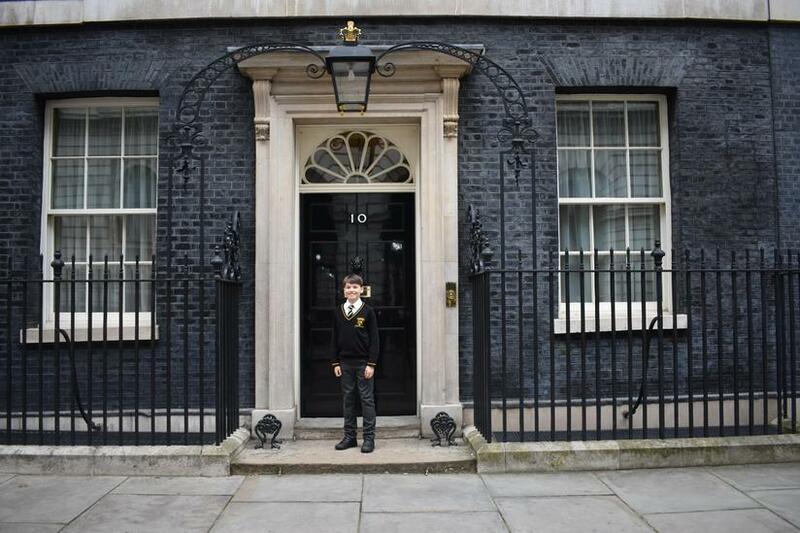 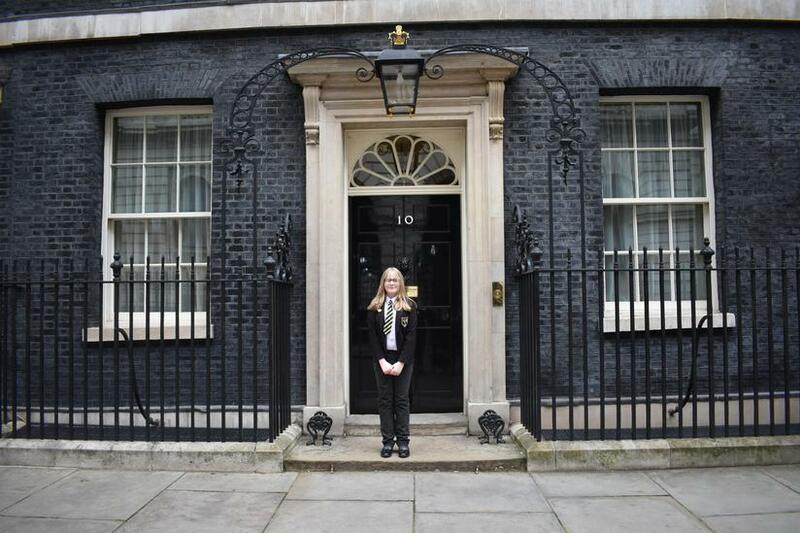 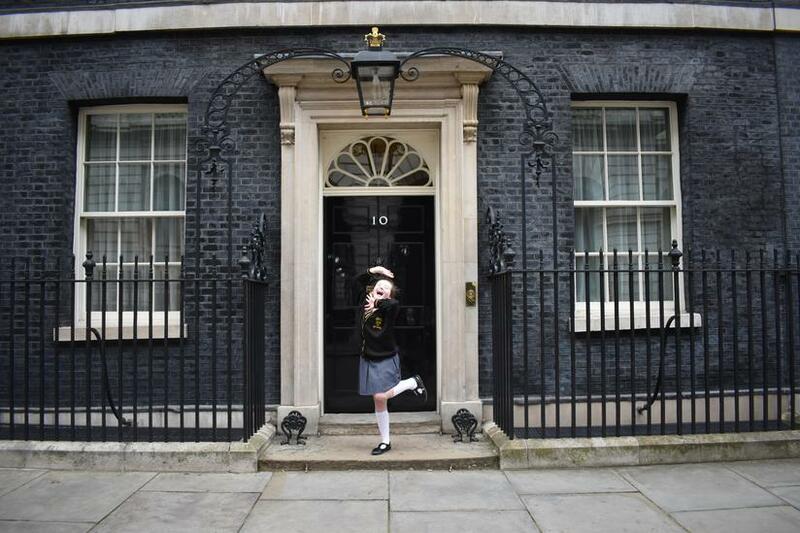 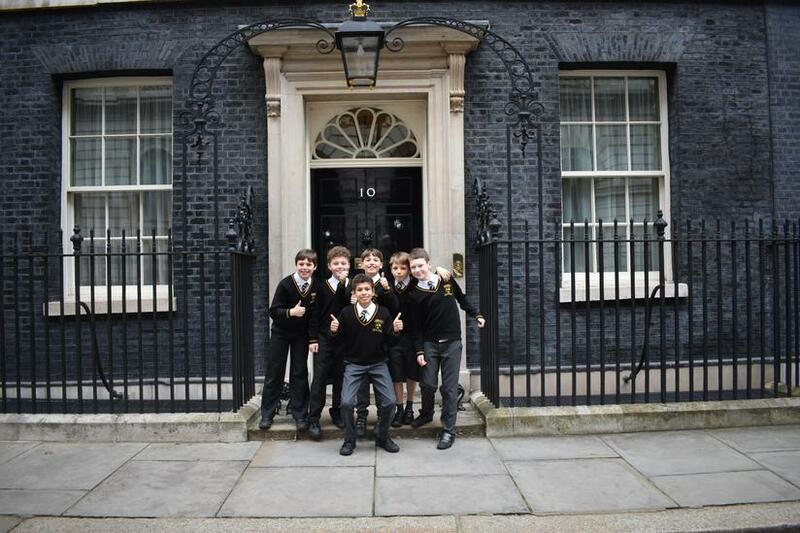 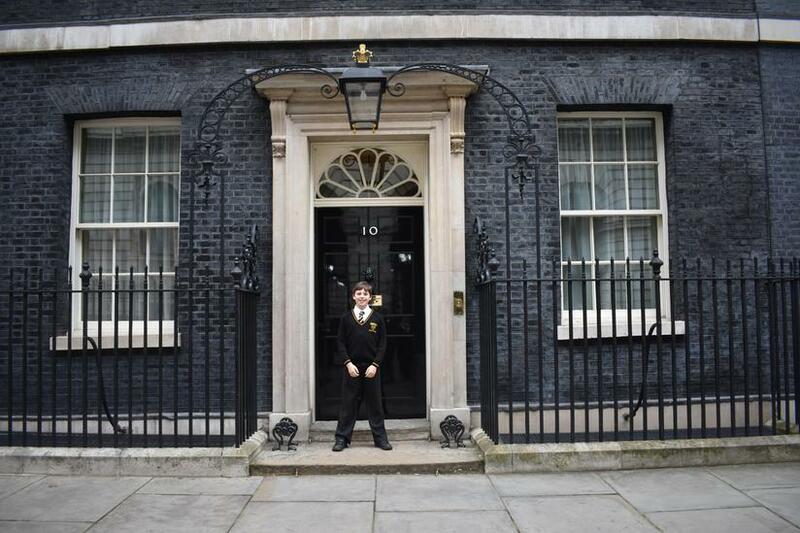 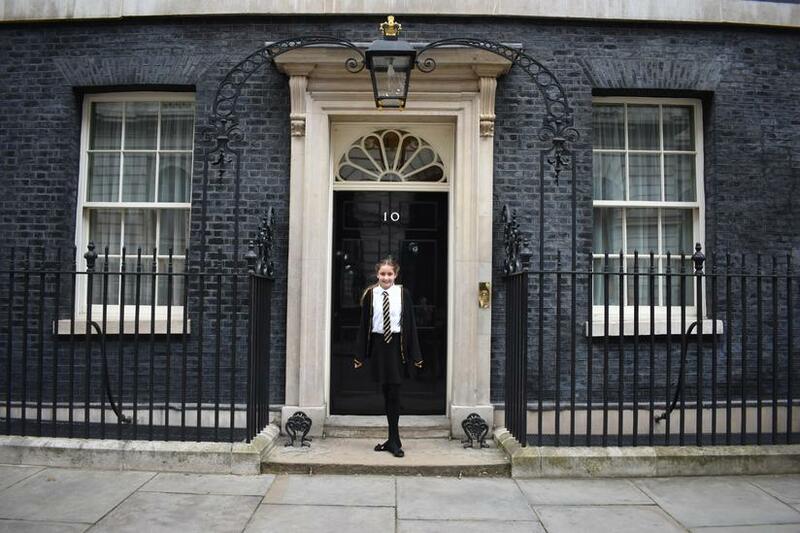 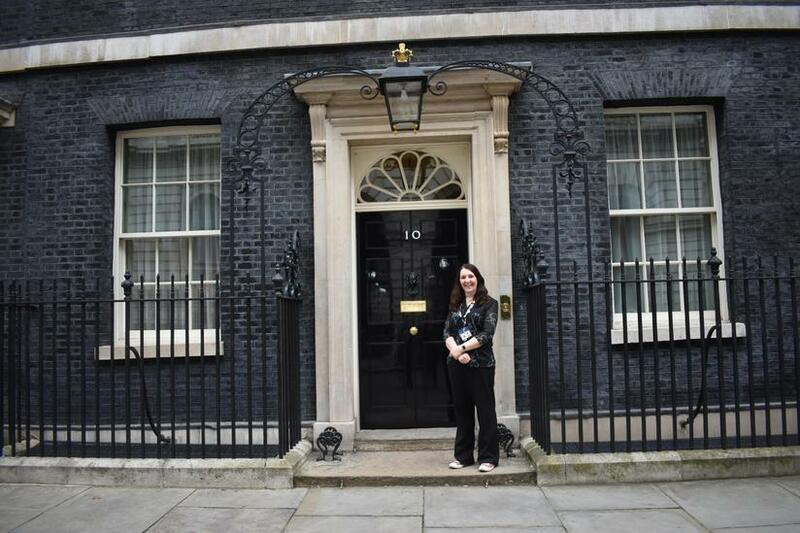 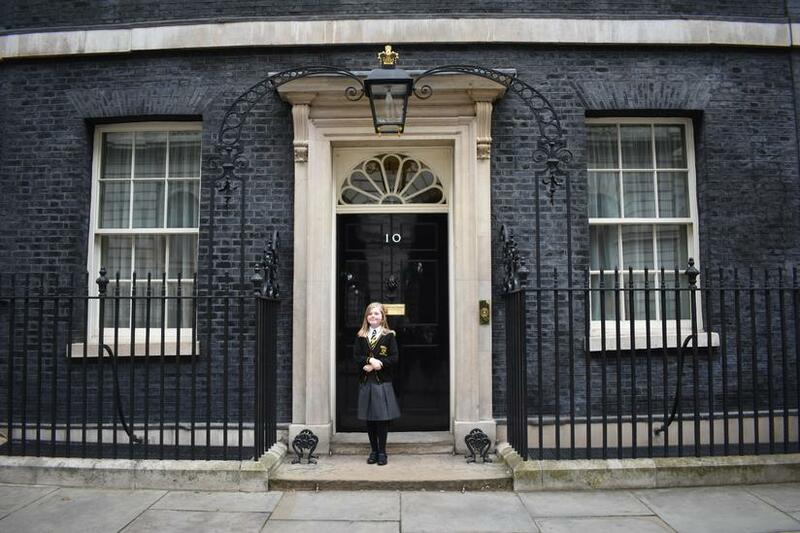 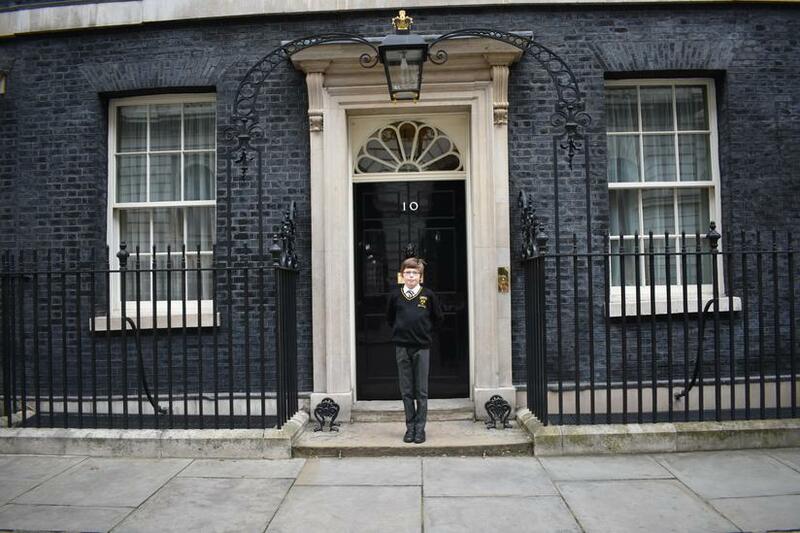 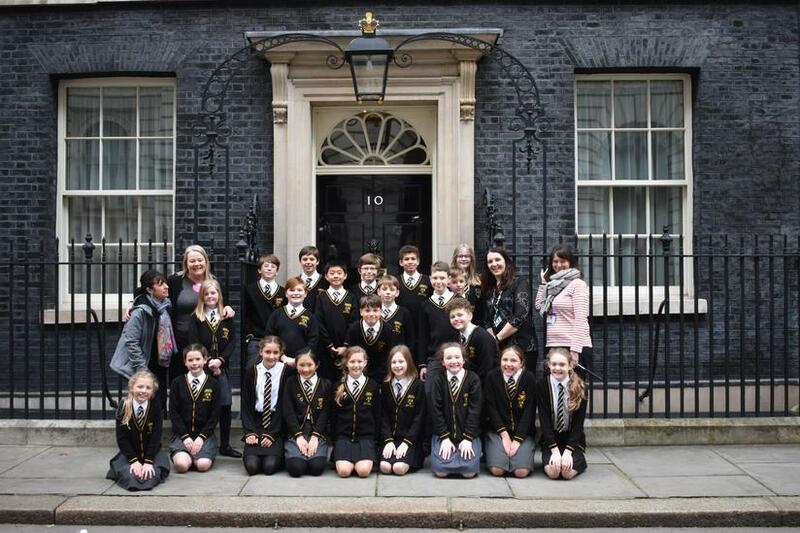 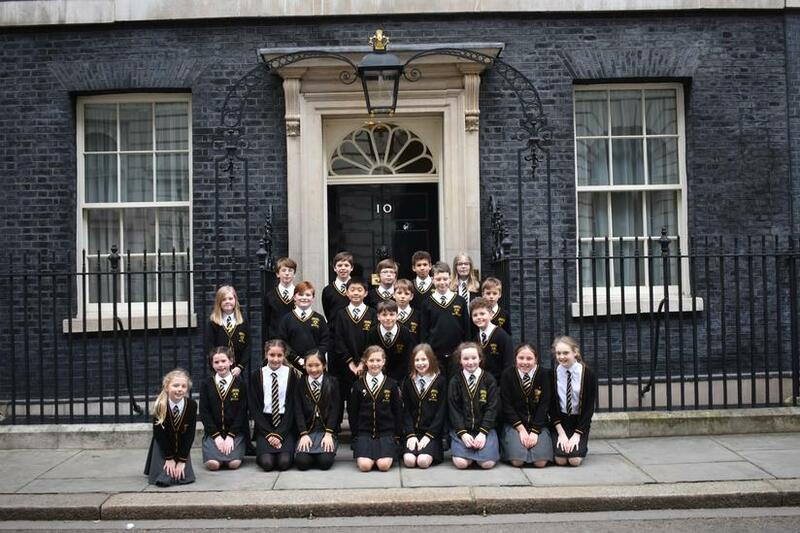 Once inside we learnt that the front door, and only access to number 10, is opened approximately 3000 times a day. 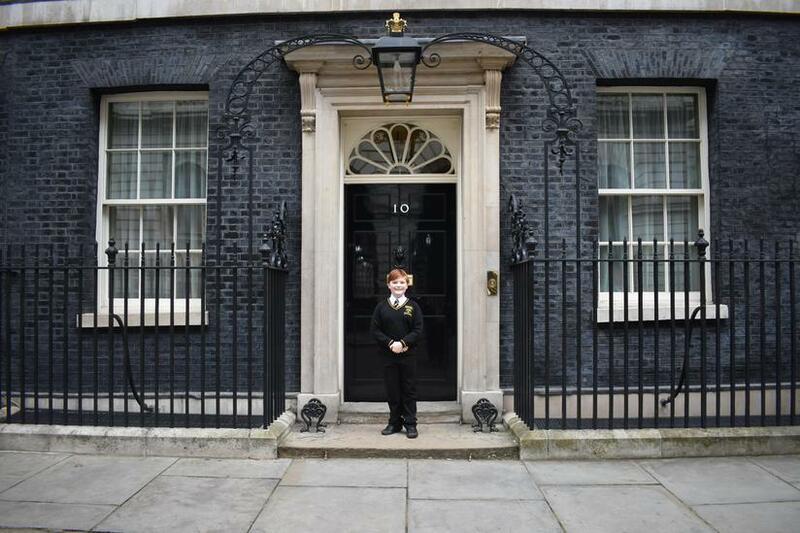 It can’t be opened from the outside, so someone is always on duty inside. 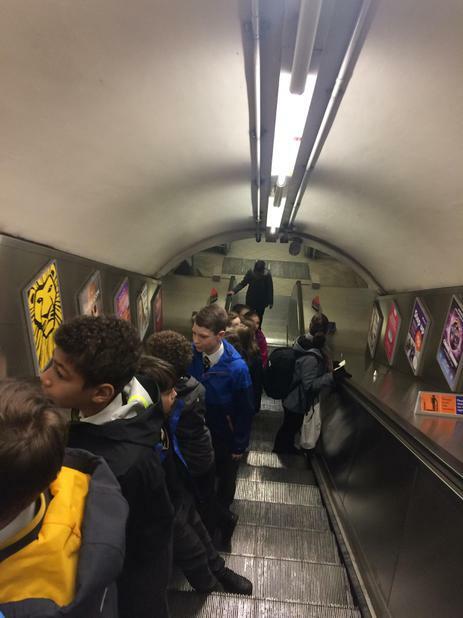 We were then led through the magnificent corridor to the main staircase (remember the one from Love Actually). 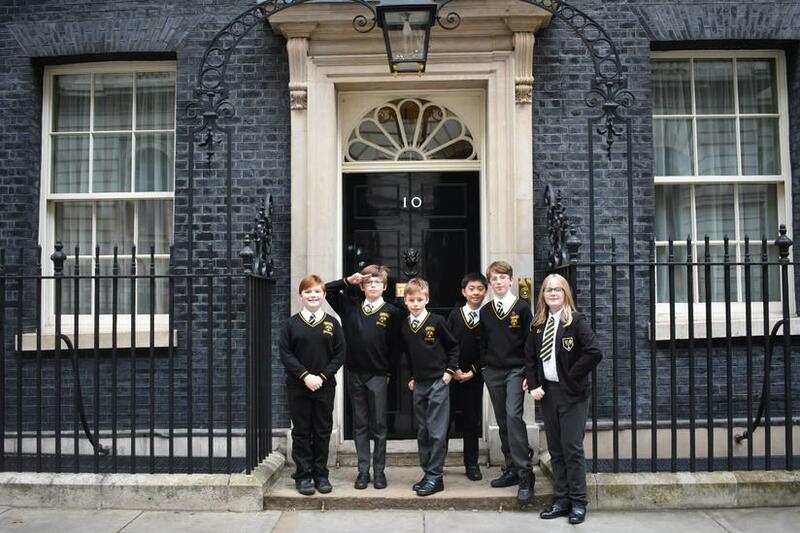 We saw the photographs of all of the prime ministers as we climbed to the top and learned that when we get a new prime minister all of the photographs are shunted down a place to make space for the photograph of the exiting prime minister. 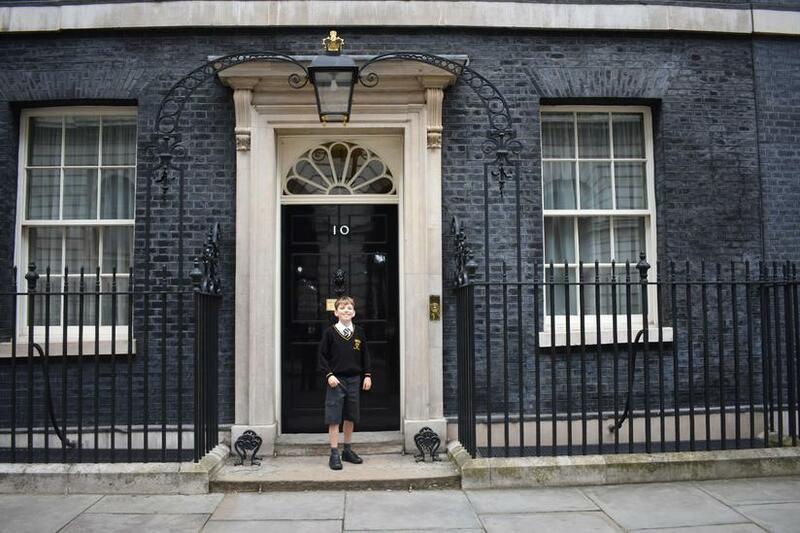 The current prime minister doesn’t have a photograph on the wall until they leave, so at the top of the stairs we saw David Cameron. 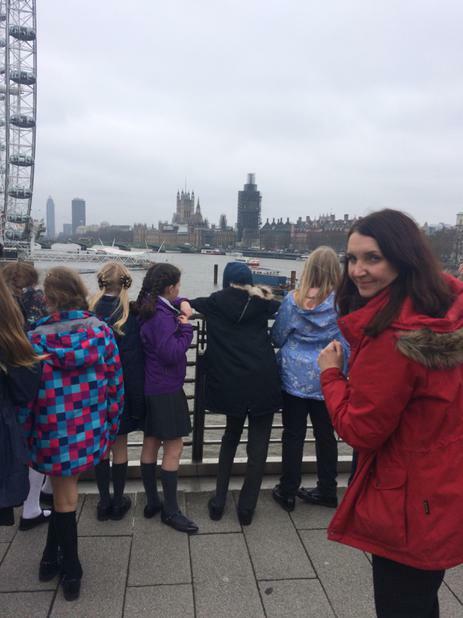 We then walked past an original Lowry on the way to the cabinet room! 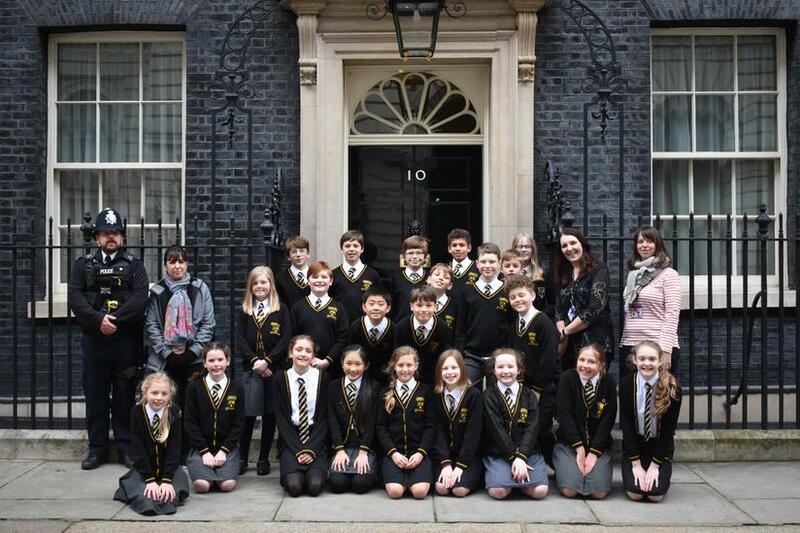 We were invited through the doors and to take a seat at the cabinet table. 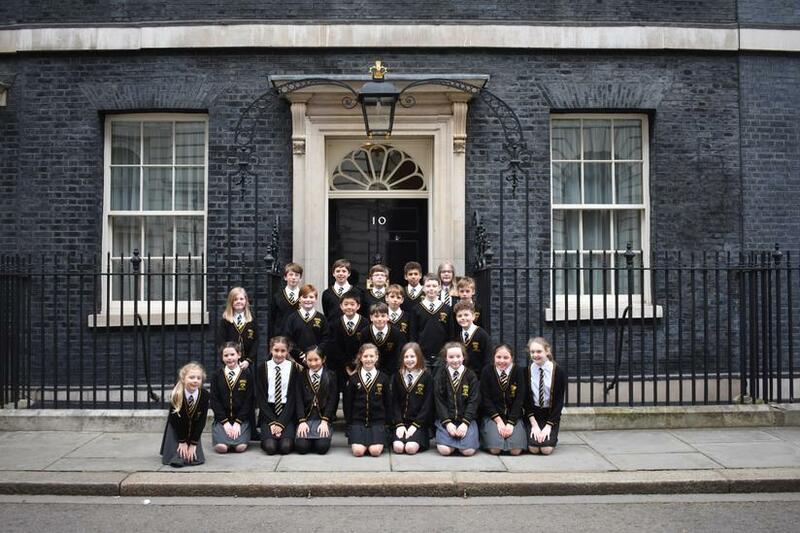 Whilst admiring a portrait of Sir Robert Walpole over the marble fireplace we learned that each seat at the table belongs to a different department and are located in accordance of seniority. 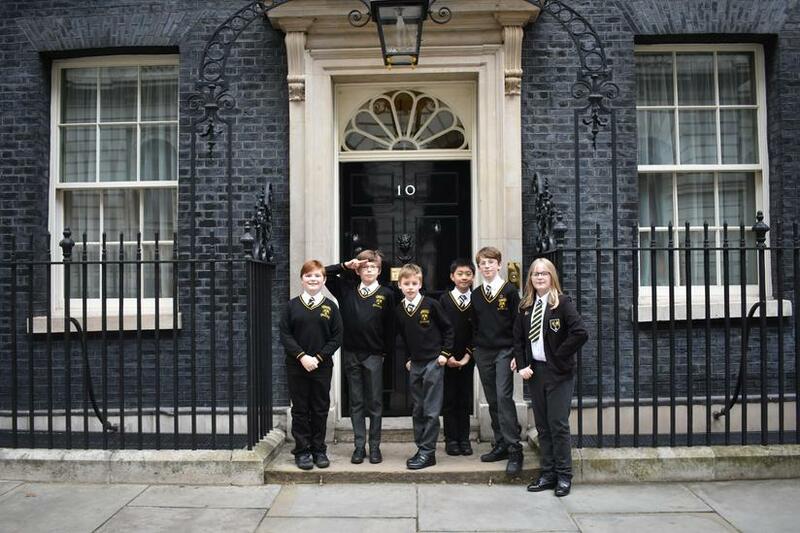 The prime ministers chair is different and is the only one with arms. 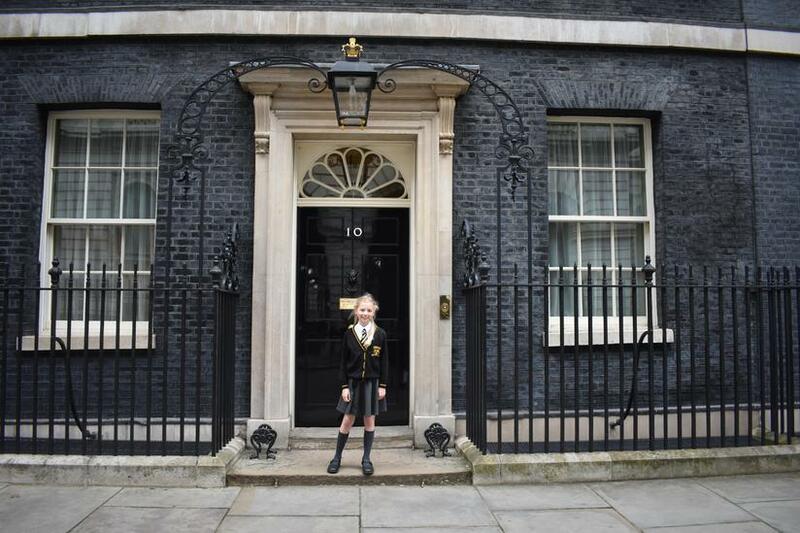 We asked Sophie, who was sat in the chair, what laws she would like to change! 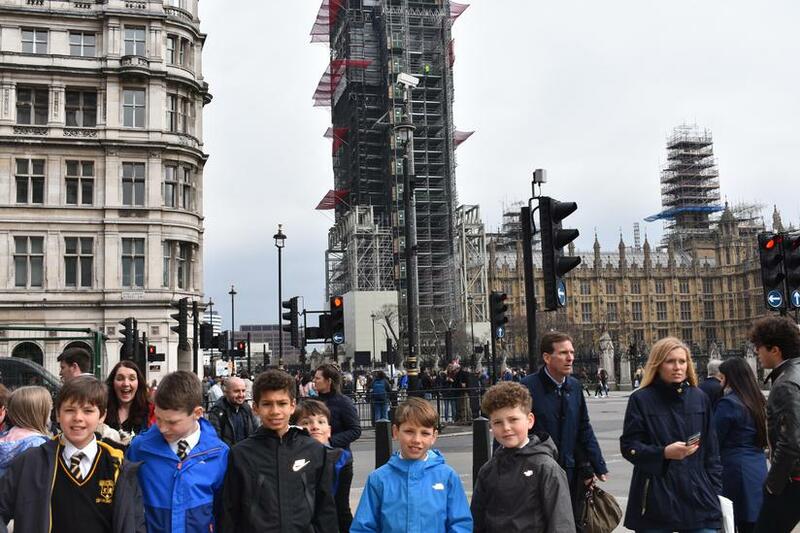 We learned where the Secretary of State for Education sat and how the table is shaped like a boat so everyone can see everyone when seated. 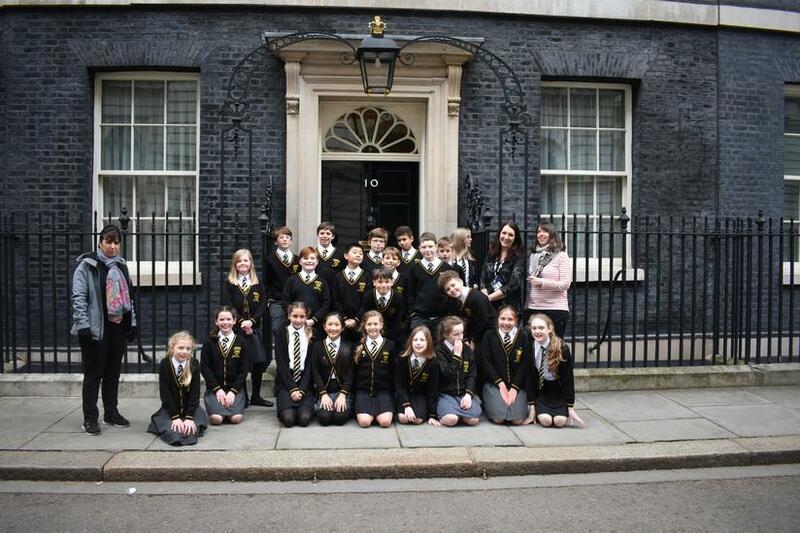 We then moved into the White Room where the prime minister entertains dignitaries. 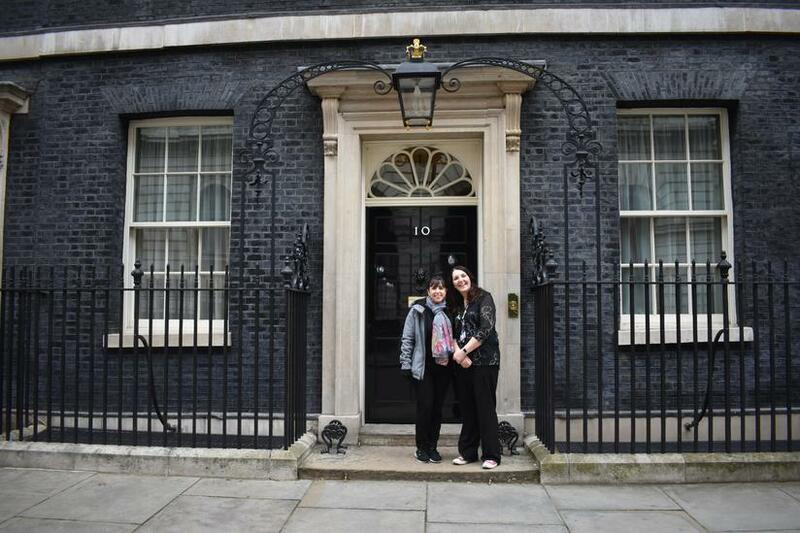 We sat in the same chair that Nelson Mandela and Barack Obama sat in and heard about the priceless chandeliers, which are washed every year in Fairy washing up liquid! 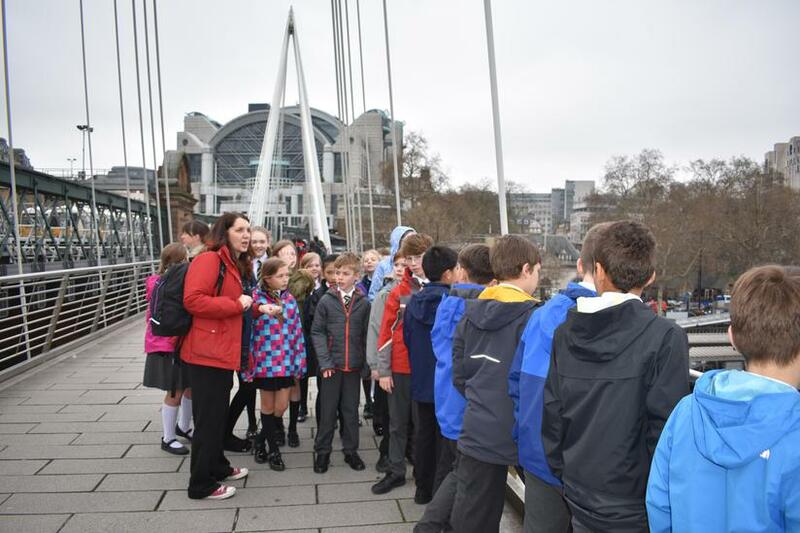 A highlight was learning we were looking at an original Turner painting worth £10.5million. 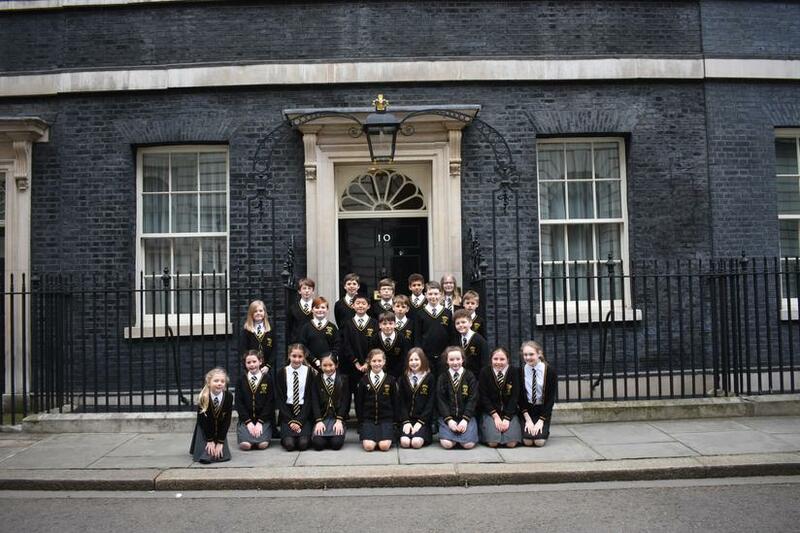 Our next stop was the Terracotta Room, named after its paint colour. 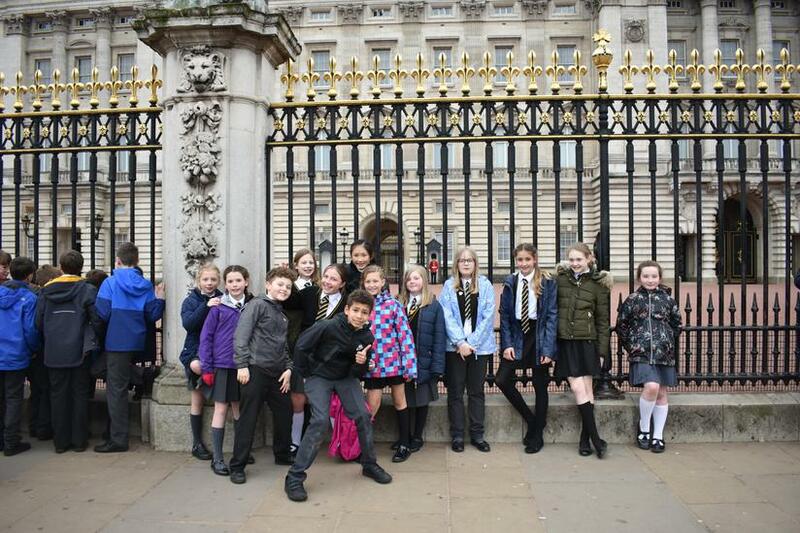 It has previously been called the Blue Room and the Green Room and also houses a priceless chandelier. 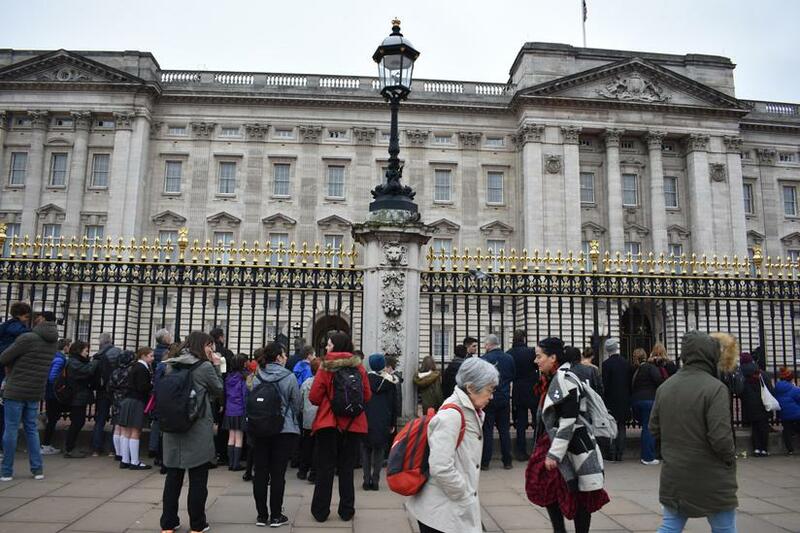 Though the double doors we entered The Pillard Room with a portrait of Queen Elizabeth I over the fireplace and Persian carpet on the floor. 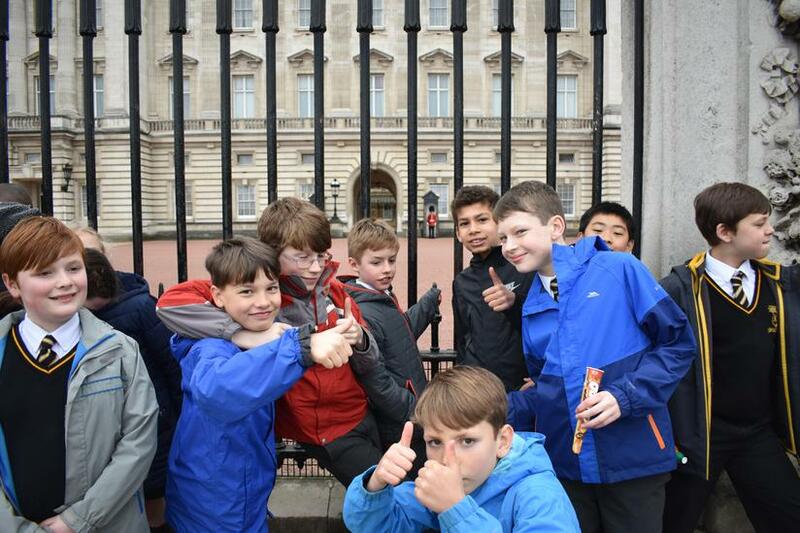 This room houses David Beckham’s Olympic torch and a set of 2012 Olympic medals. 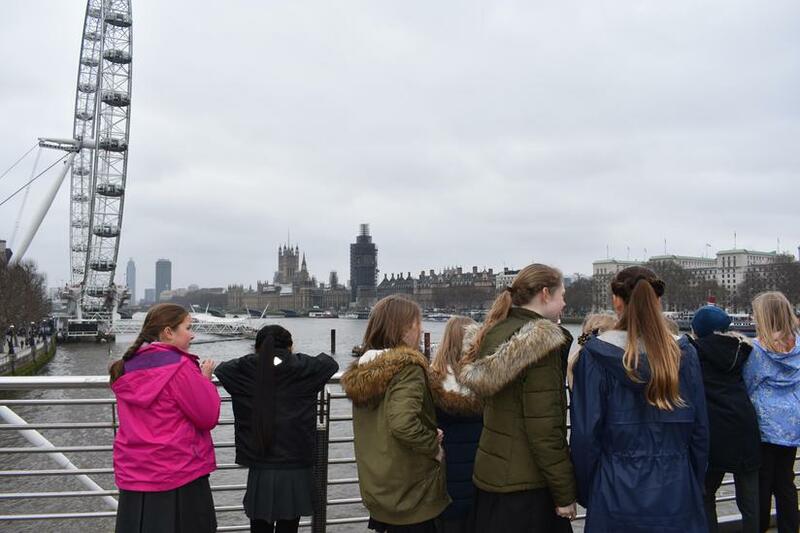 We then moved into the Small Dining Room, although it didn’t have tables and chairs, where we admired artwork and a tailor made clock whose movement link to the tides and has never lost time. 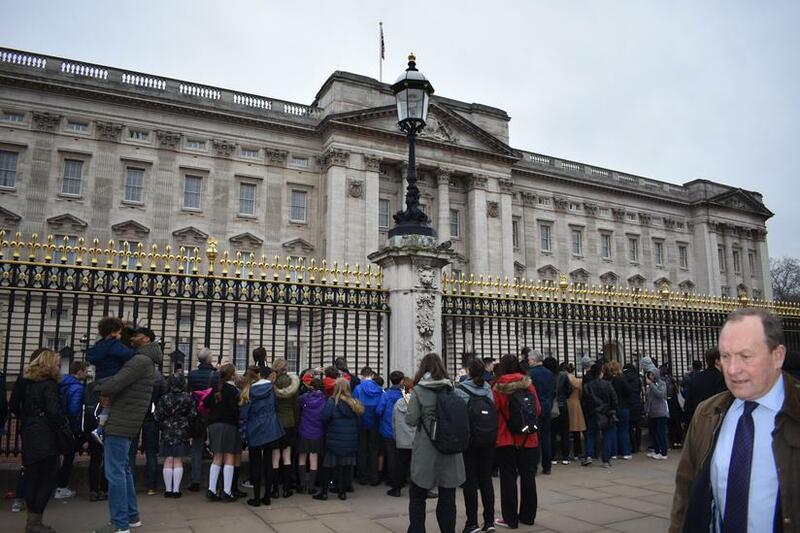 It was then time to move into the State Dining Room, which again had no tables and chairs, but hosted various artworks and silver. 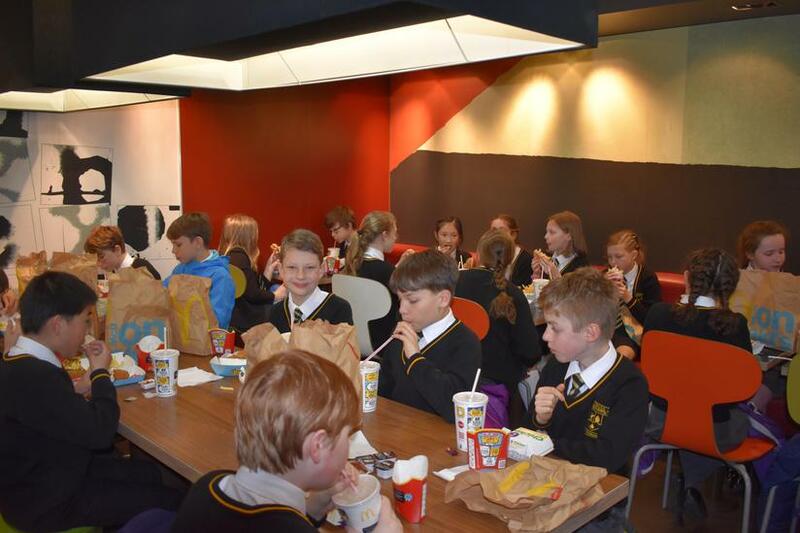 We imagined having a huge party in this room and decorating it with lights and glitter balls! 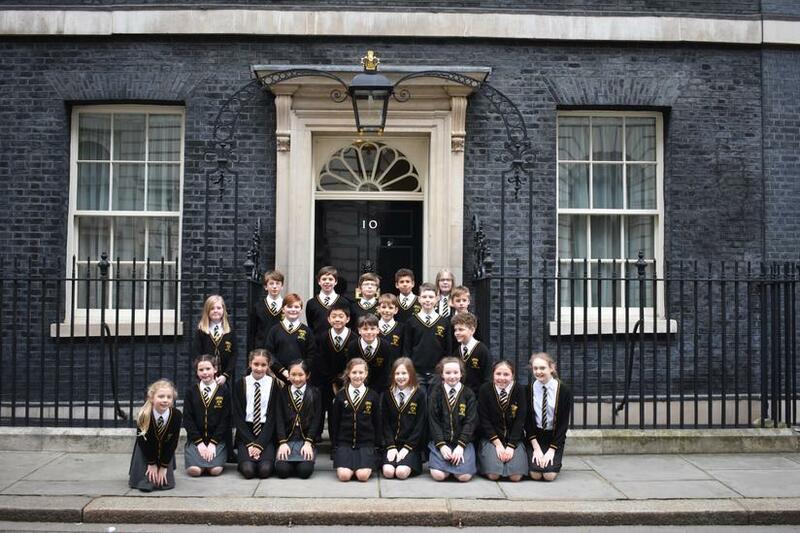 Our final stop was The Study with a portrait of Margaret Thatcher over the fireplace. 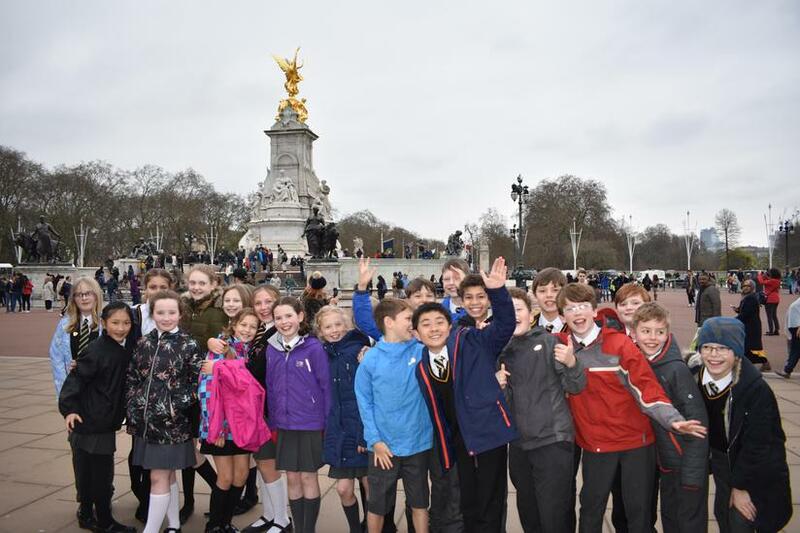 Then it was time to put on our coats and say our thanks. 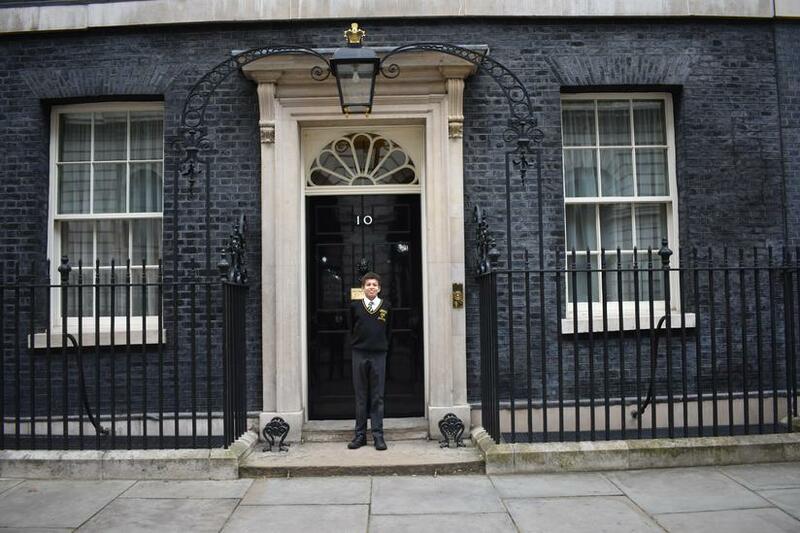 We were all given a postcard of Larry, 10 Downing Street’s cat, as we left. 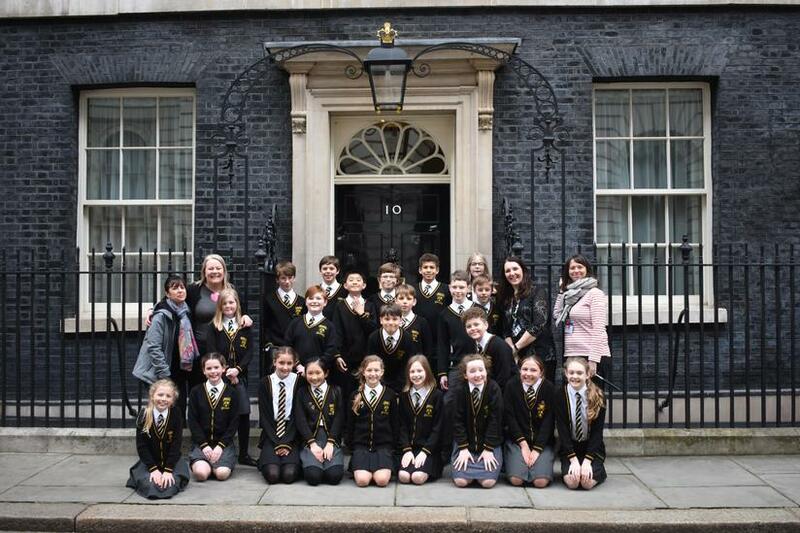 What an absolutely fantastic, once in a lifetime opportunity that we will never forget. 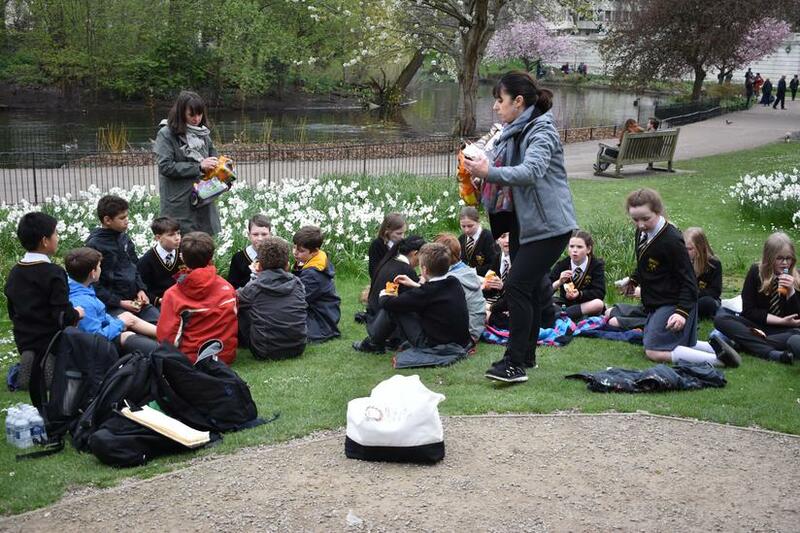 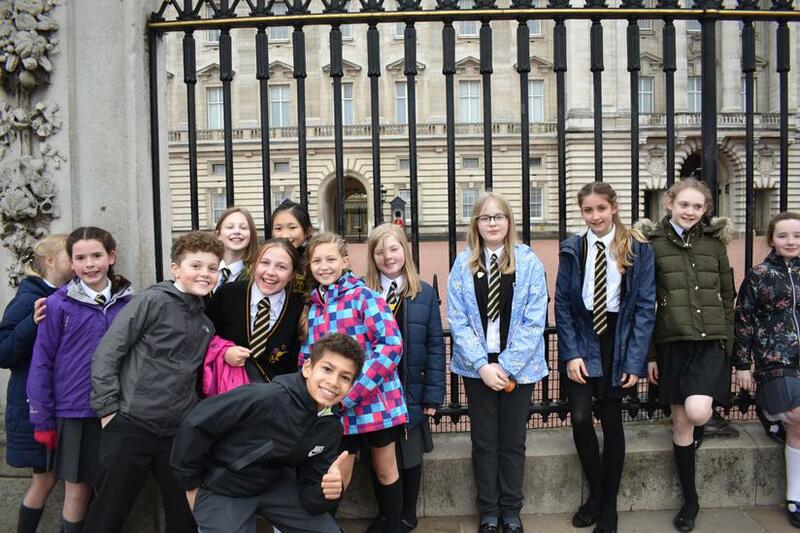 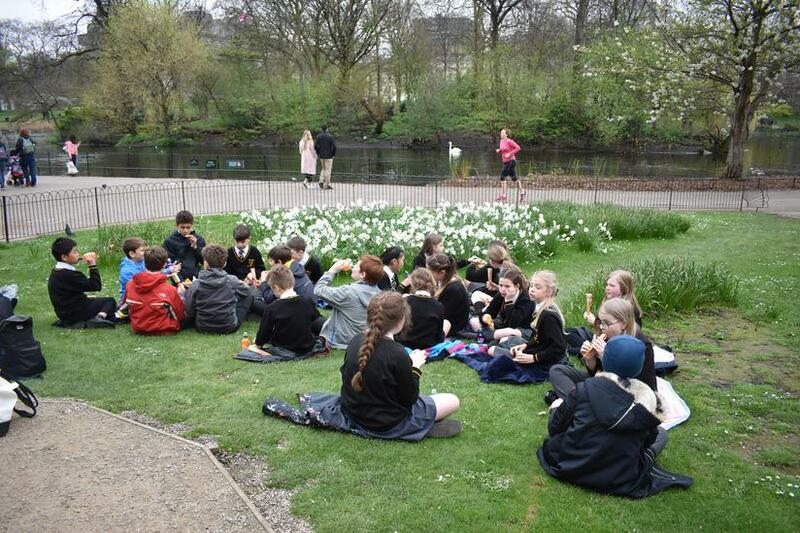 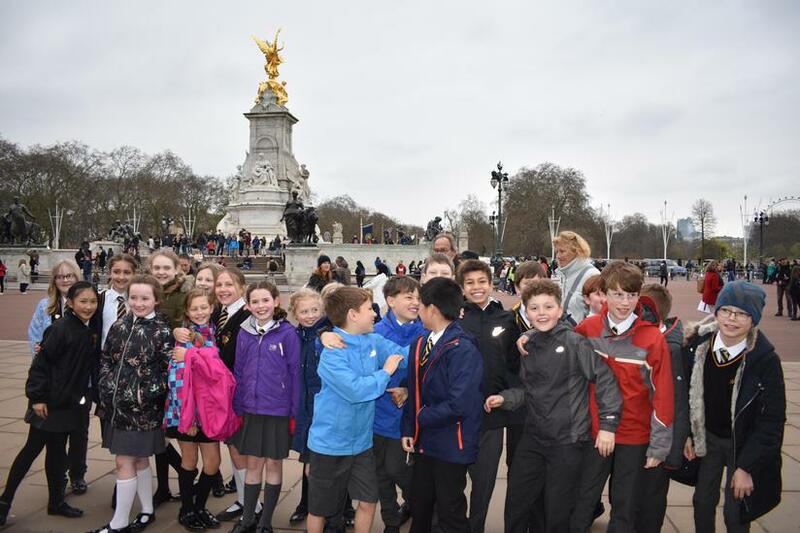 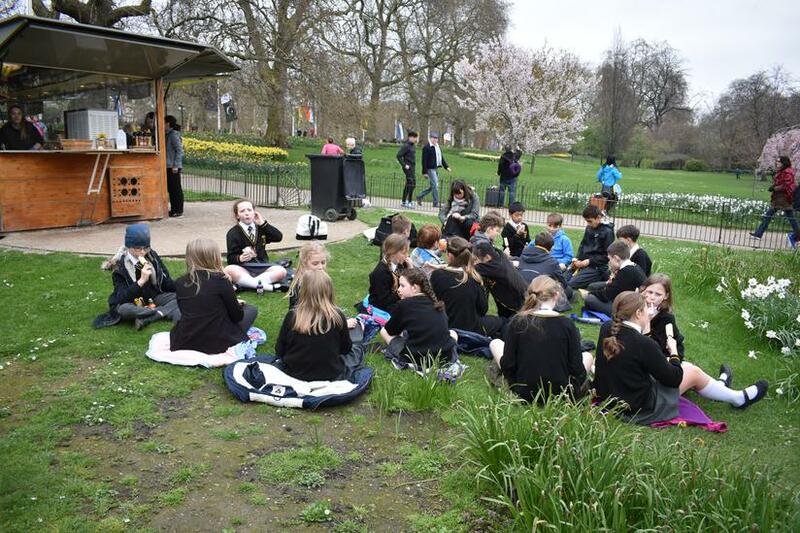 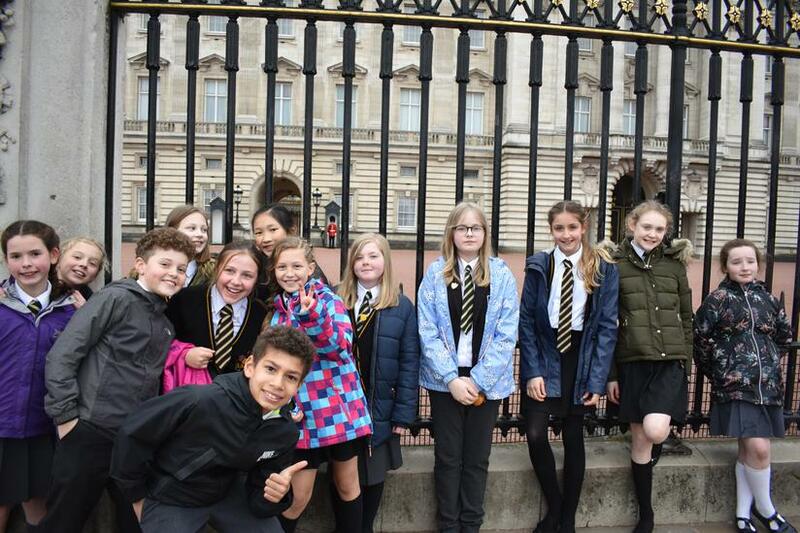 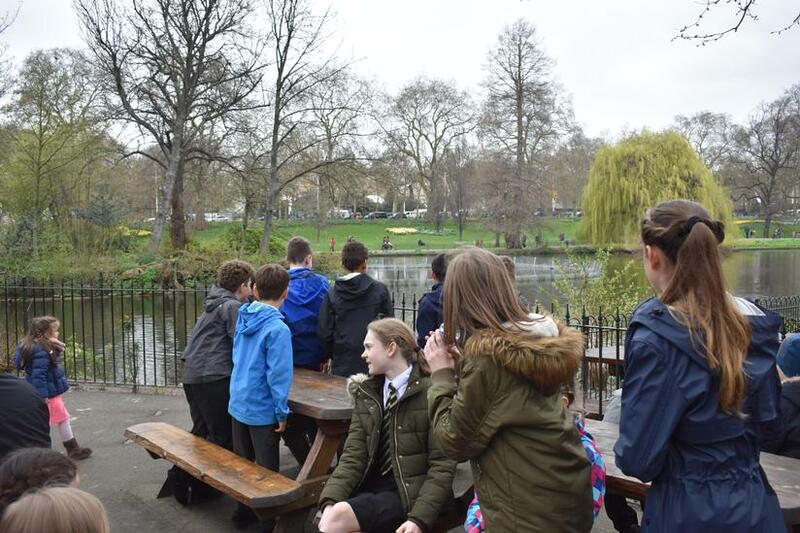 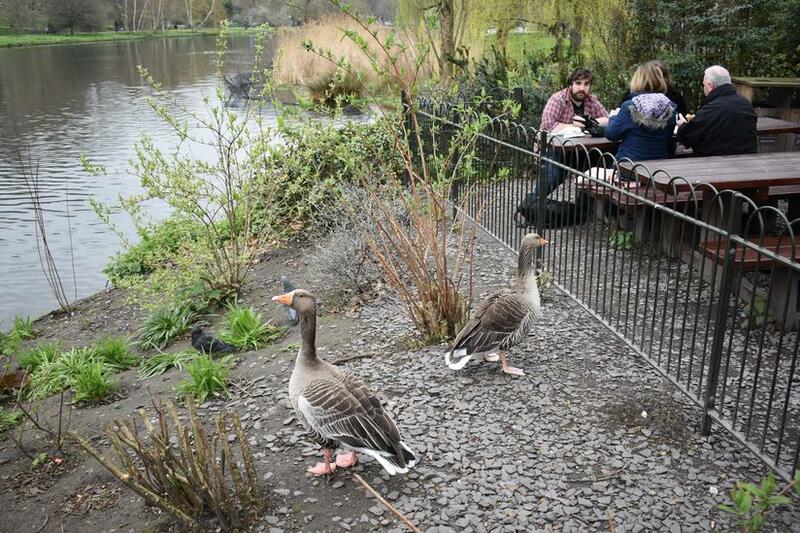 The day was not over as we made our way to St James’s Park where we had a well-deserved sit down and ice cream break before we headed to Buckingham Palace. 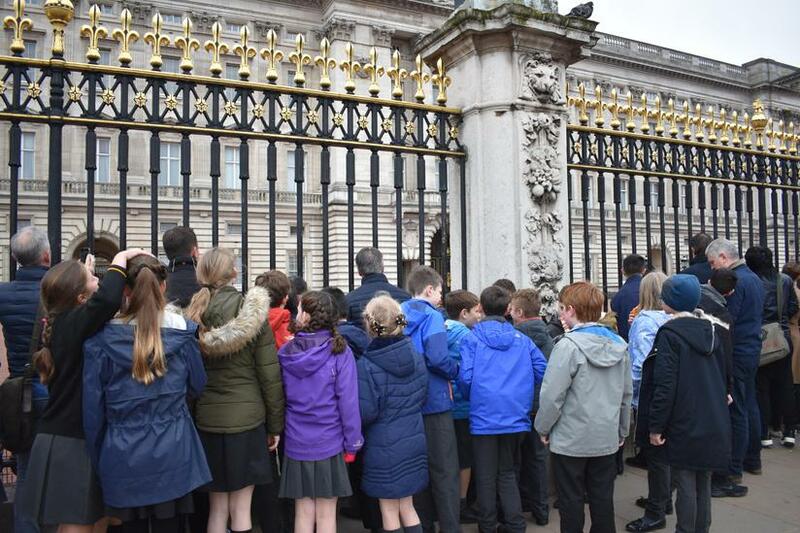 We saw the guards and learned about the flags that fly to show when the Queen is in residence. 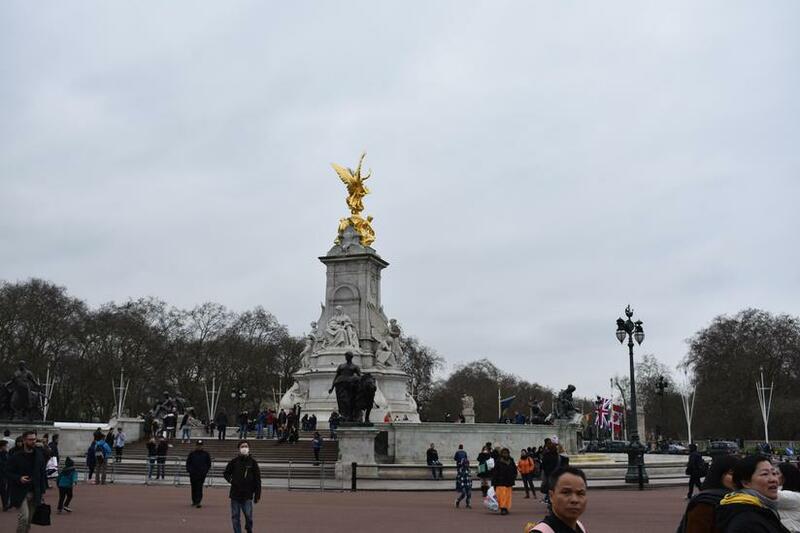 It was the Union Flag today, meaning the Queen wasn’t there. 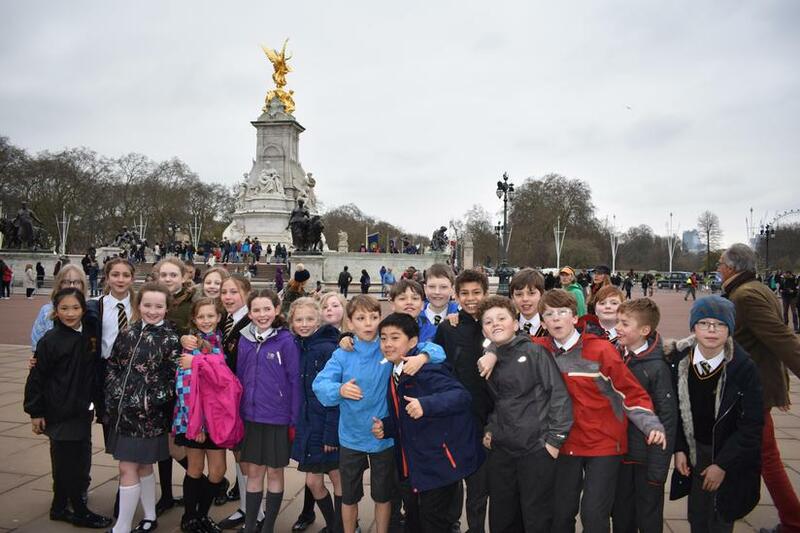 A quick photo with the Victoria Memorial monument and it was time to head back to Euston Station. 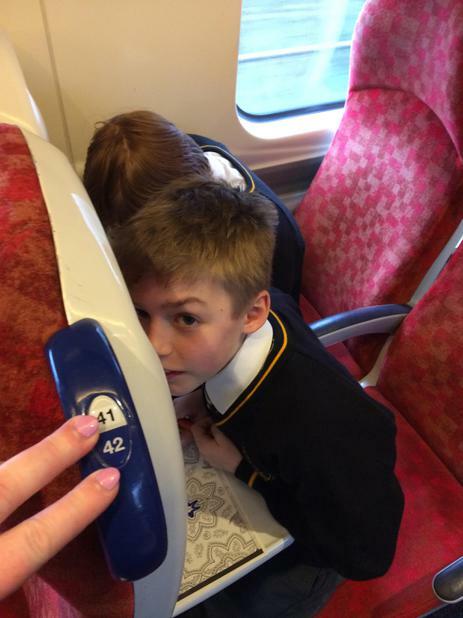 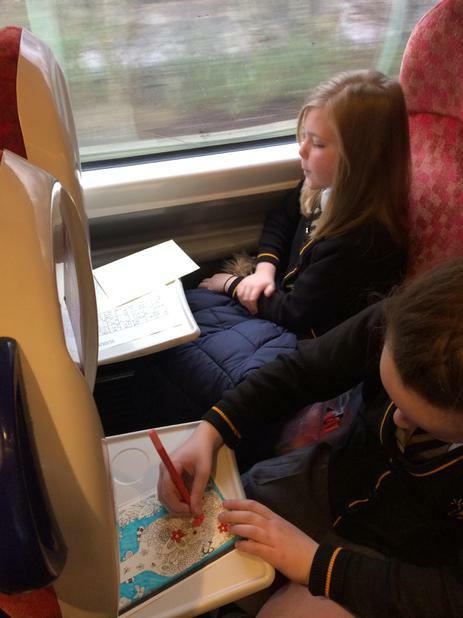 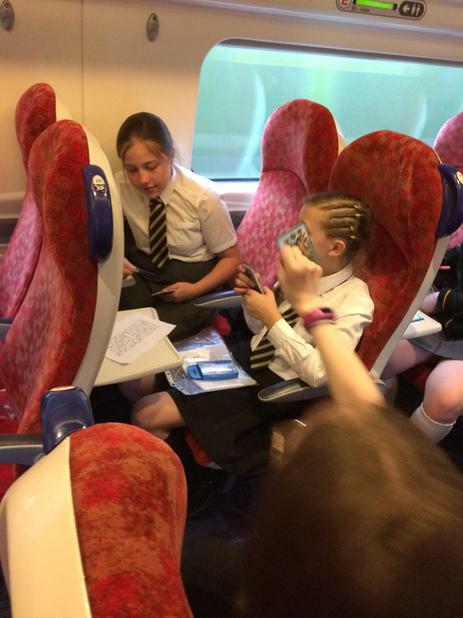 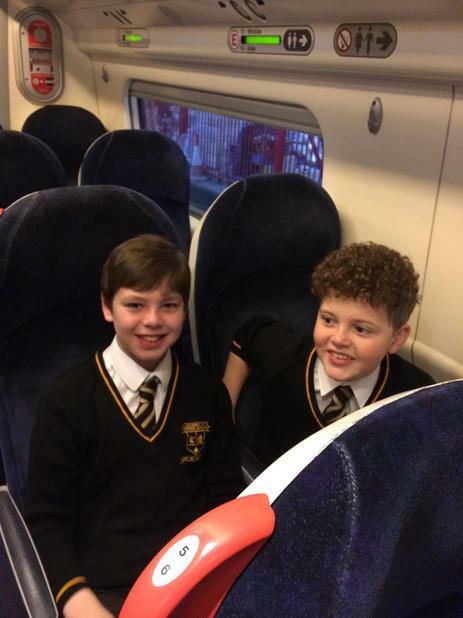 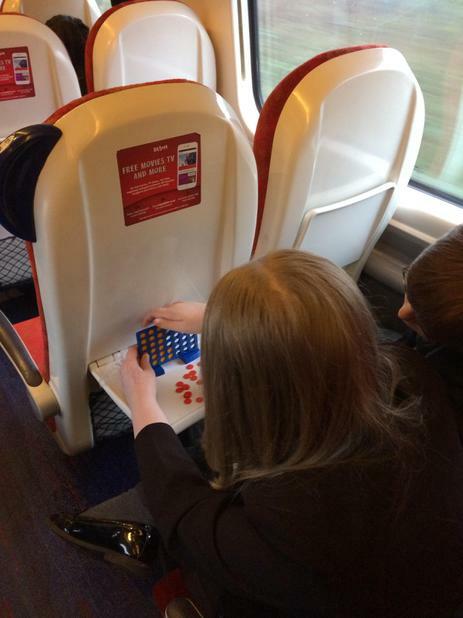 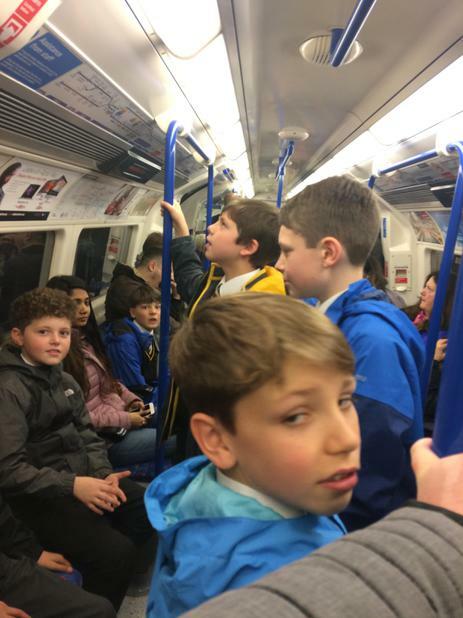 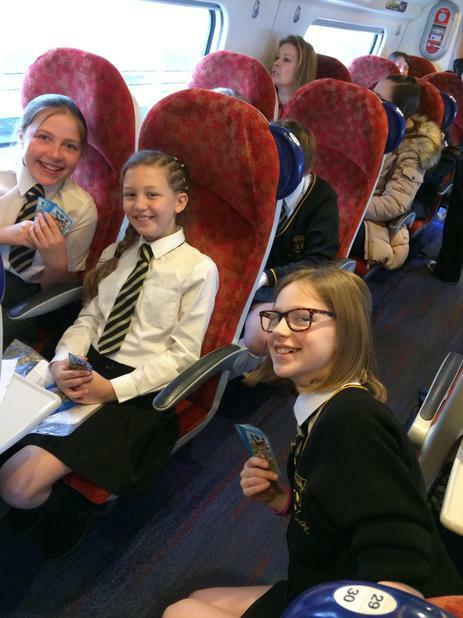 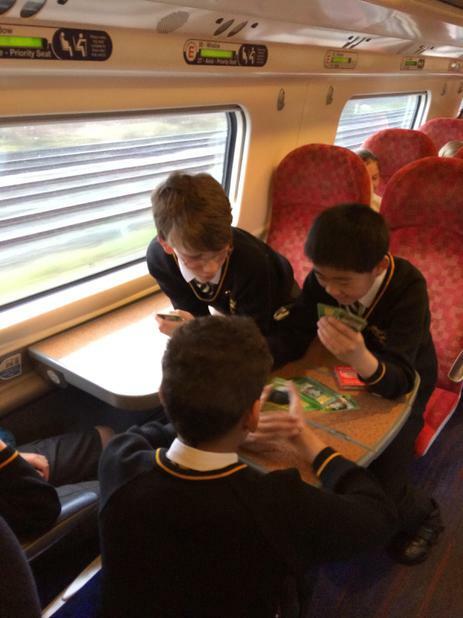 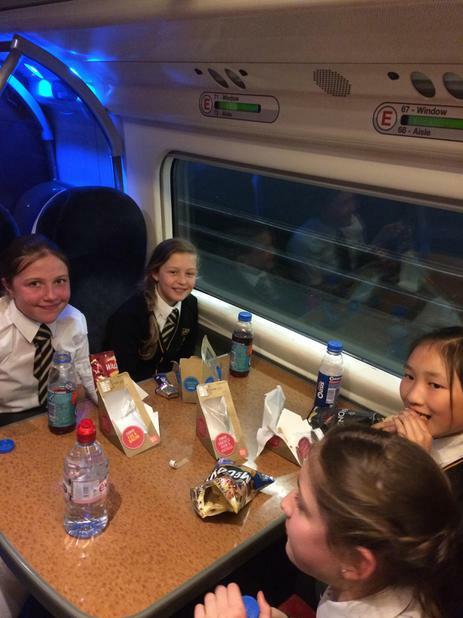 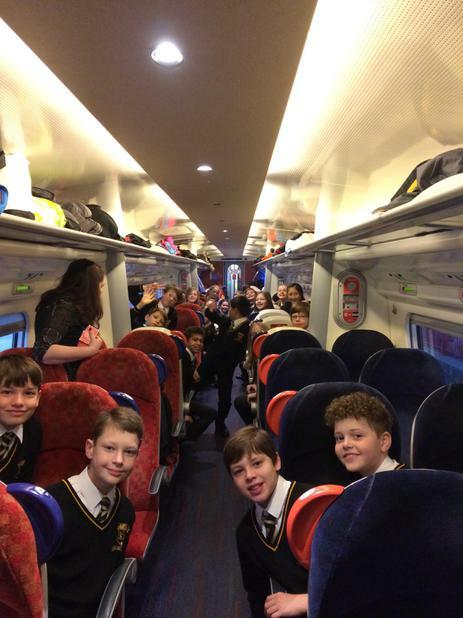 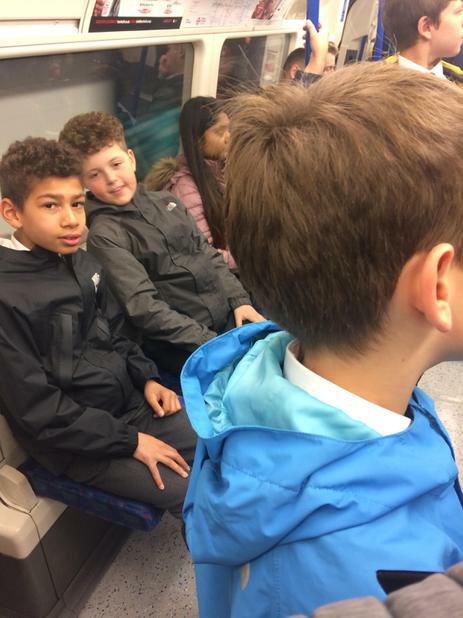 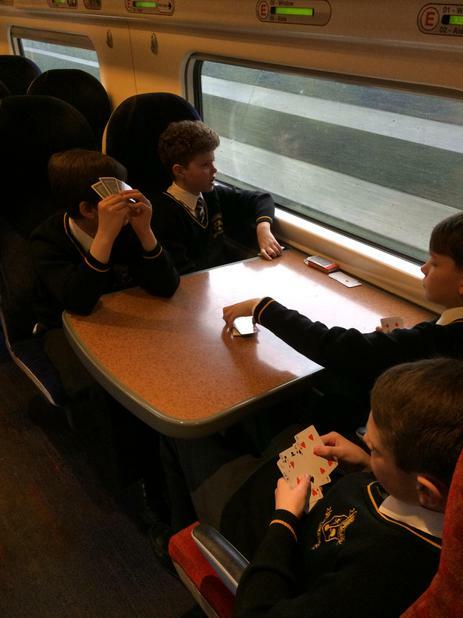 We stopped to collect our dinner to have on the journey home and made our way back on the underground and boarded the train home. 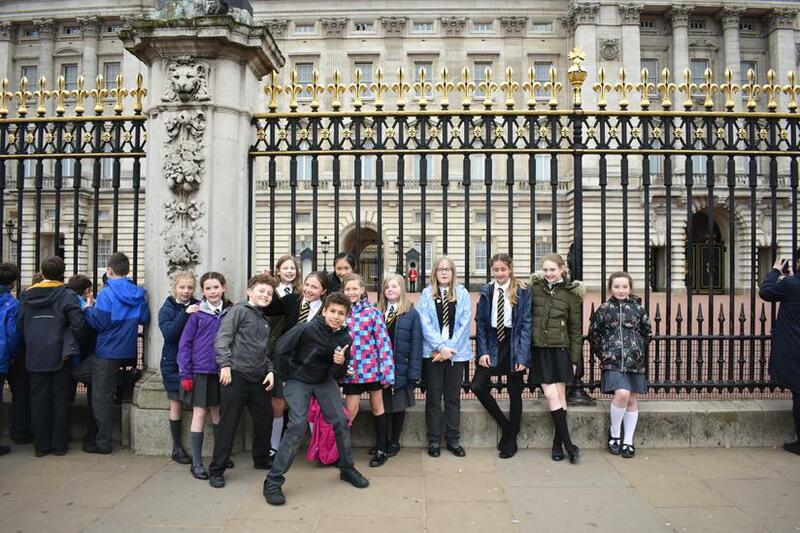 Have a look through our photographs below; I’m sure you will agree, we had an absolutely fabulous day.